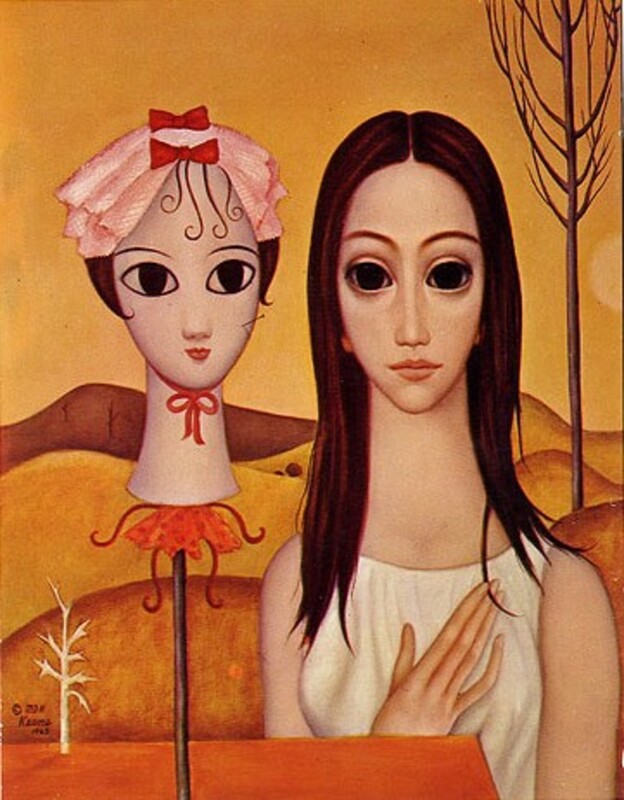 Margaret Keane, a famous American artist and pop culture icon, is universally known as the "mother of big-eye art." 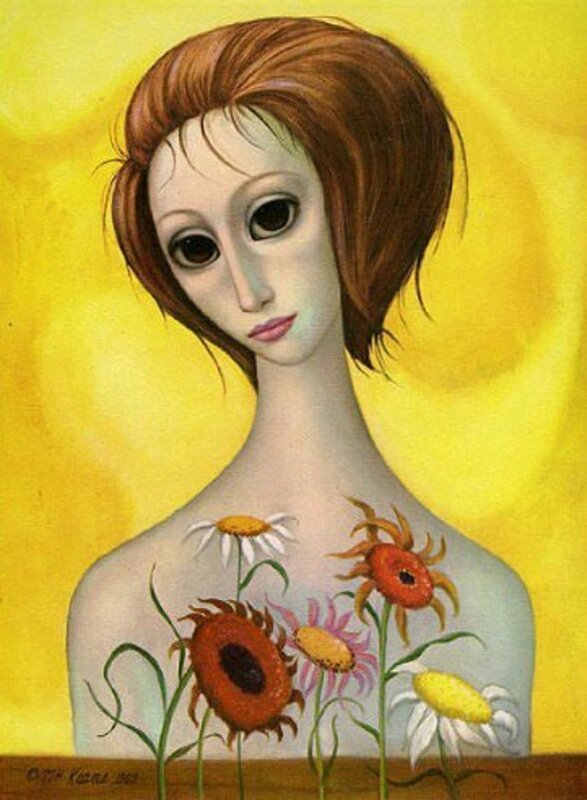 In the 1950s, Margaret's sad-eye waif paintings captured the public's hearts, creating a sensation; mass-marketed prints of these works became wildly popular, and were sold almost everywhere, starting in the 1960s, and continuing into the '70s. 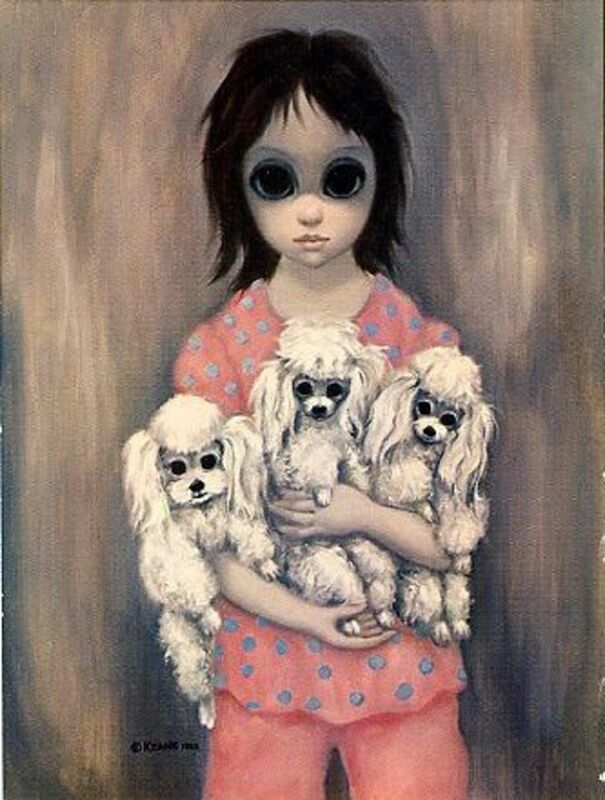 The popularity of Margaret's big-eye children inspired many a copycat artist to emulate her kitschy style, and her legacy still lives on today. 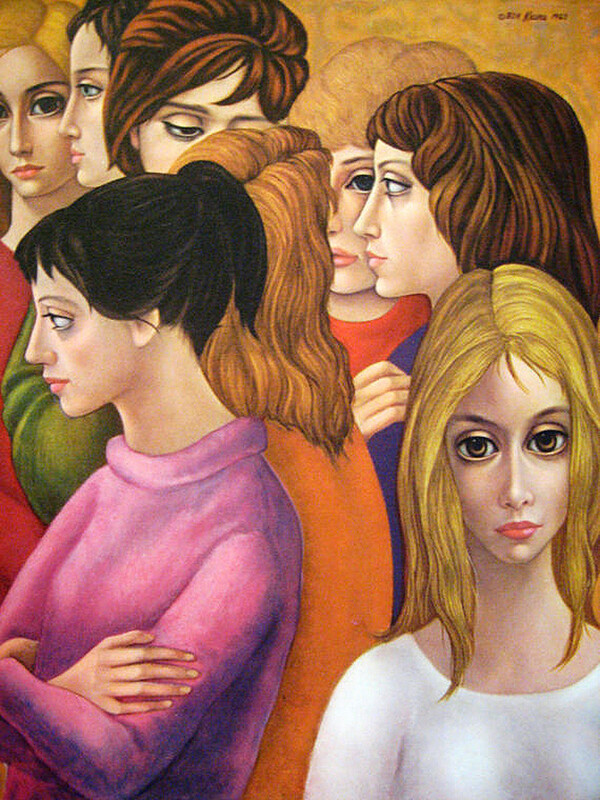 I am one of a number of today's artists who still look to Margaret Keane for inspiration; as a present-day practitioner of the big-eye art style, I draw volumes of inspiration from the poignant renderings of Keane's giant-orbed children, whose hypnotic gaze perpetually resides in the back of my mind, touching in some way, every single painting that I have the pleasure of creating. "The eyes I draw on my children are an expression of my own deepest feelings. Eyes are windows of the soul." 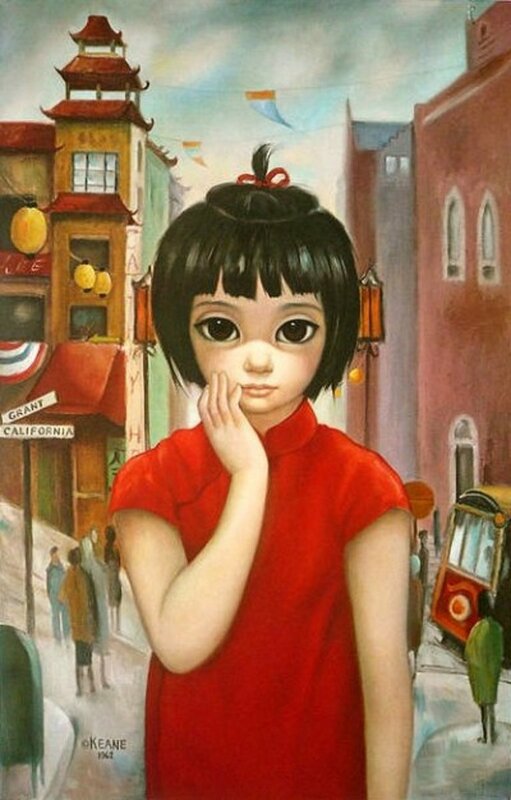 Margaret Keane on Her Life and "Big Eyes"
"Big Eyes," the Tim Burton produced biopic detailing the life of Margaret Keane, premiered on Christmas day, 2014. Big Eyes, which had been in the works since 2009, underwent several cast changes. Originally, Kate Hudson was in the starring role as Margaret, then Reese Witherspoon was cast in the role. After Tim Burton took over as director, he cast Amy Adams (a four-time Oscar nominee) and Christoph Waltz (a two-time Oscar winner) in the roles of Margaret and Walter. The film is distributed by the Weinstein Company. 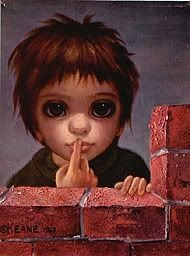 I'm really looking forward to seeing Big Eyes; the tribute to American artist and pop icon Margaret Keane is long overdue. Big Eyes DVD--Order Your Copy Now! In 1992, Adam Parfrey set out to track down Walter Keane for a San Diego Reader cover story; in the process, he uncovered some shocking facts. 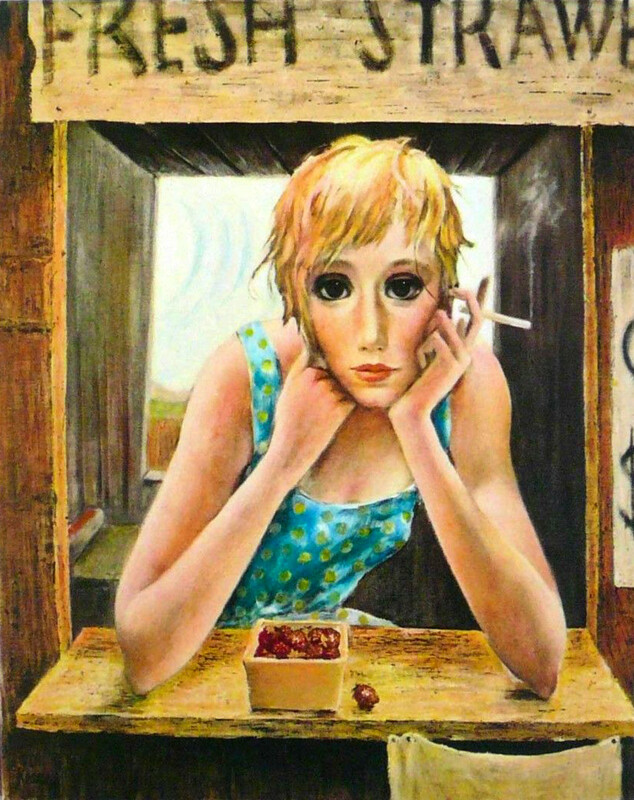 Walter Keane, the "artist" he attributed to the creation of the big-eyed waif paintings, turned out to be little more than a con artist. 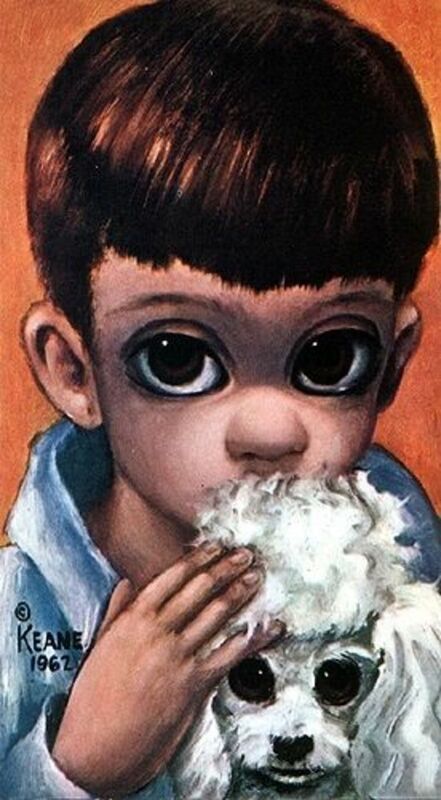 Parfrey's story, which was reprinted in Juxtapoz magazine, inspired a Margaret Keane exhibition at the Laguna Art Museum. Now renowned director Tim Burton is filming a movie about the Keanes, titled, Big Eyes, which is set for release in 2014. Citizen Keane: The Big Lies Behind the Big Eyes, is an expansion of Parfrey's article, supplemented with all sorts of fascinating biographical and sociological details in addition to photographs, color reproductions, appendices with legal documents and more. Born Peggy Doris Hawkins in 1927, Margaret was sickly, shy, and often alone. Showing an early talent for art, she entertained herself by drawing which also helped fill in the gaps of loneliness. 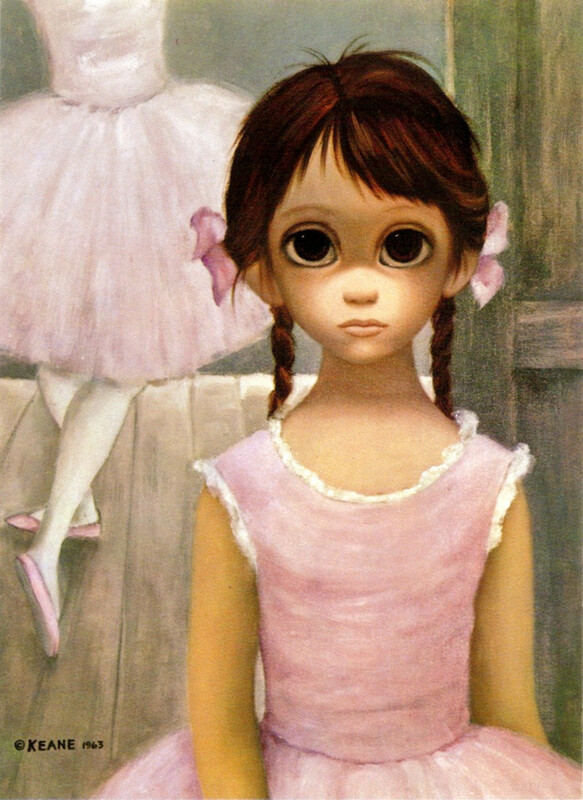 At the age of eleven, she began painting children with big eyes. Little did she know that her big-eye children would one day be a phenomenon, and she their famous creator. Her first husband, Frank Ulbrich, fathered daughter Jane, born in 1950. 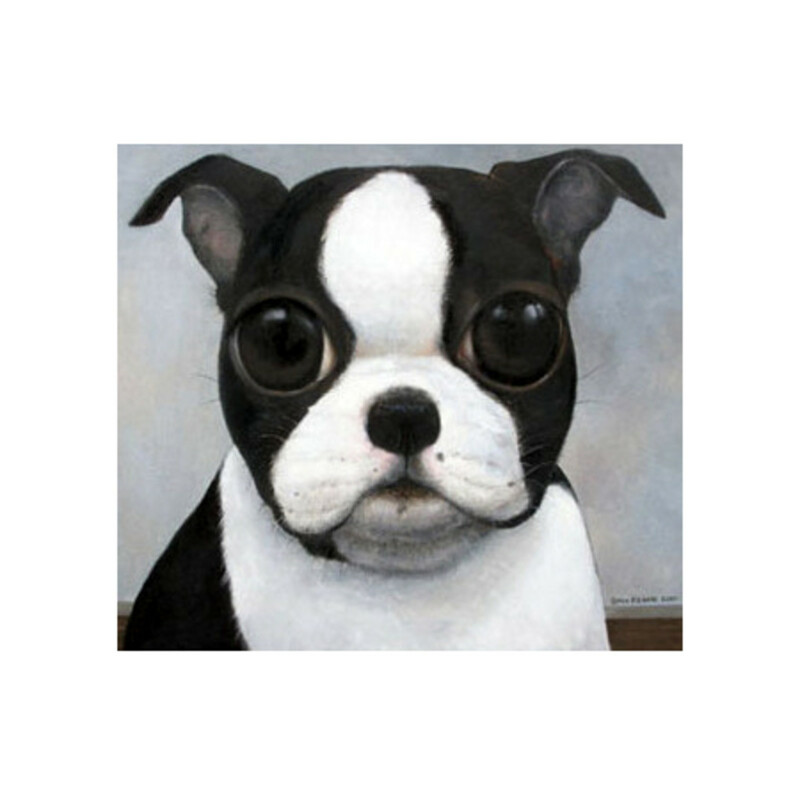 Margaret's brown-eyed infant daughter inspired her to create a portrait of her--with humongous eyes, of course. 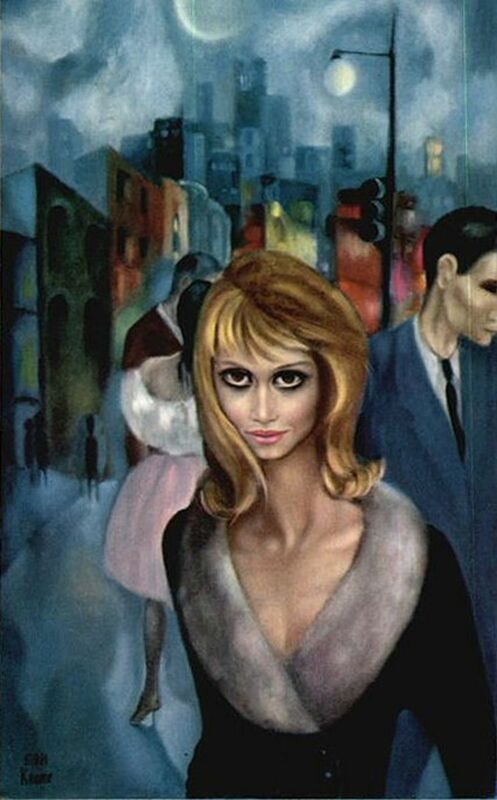 In 1955 Margaret married Walter Keane, her second marriage. 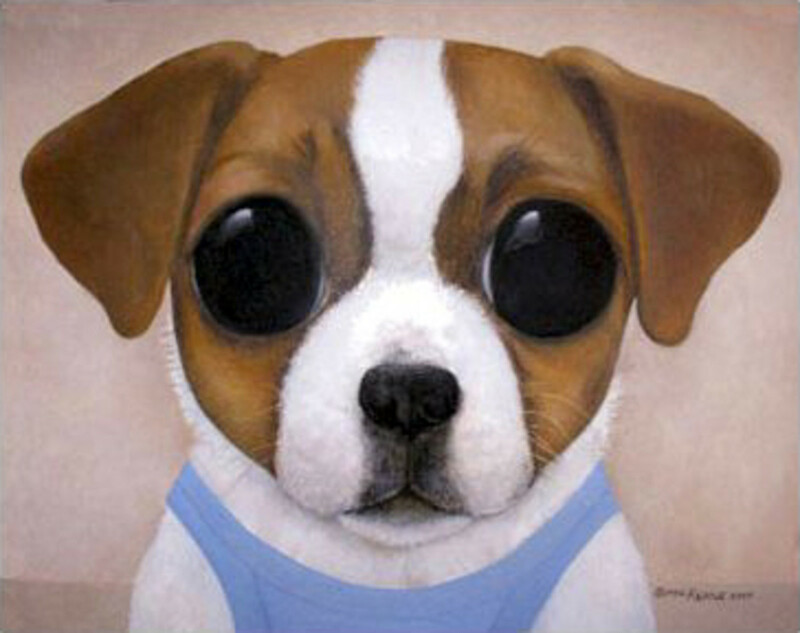 Margaret continued to perfect her unique big-eye style and in 1957, her work was exhibited at an outdoor show in Washington Square, Manhattan. Sadly, her husband Walter took credit for all the paintings! 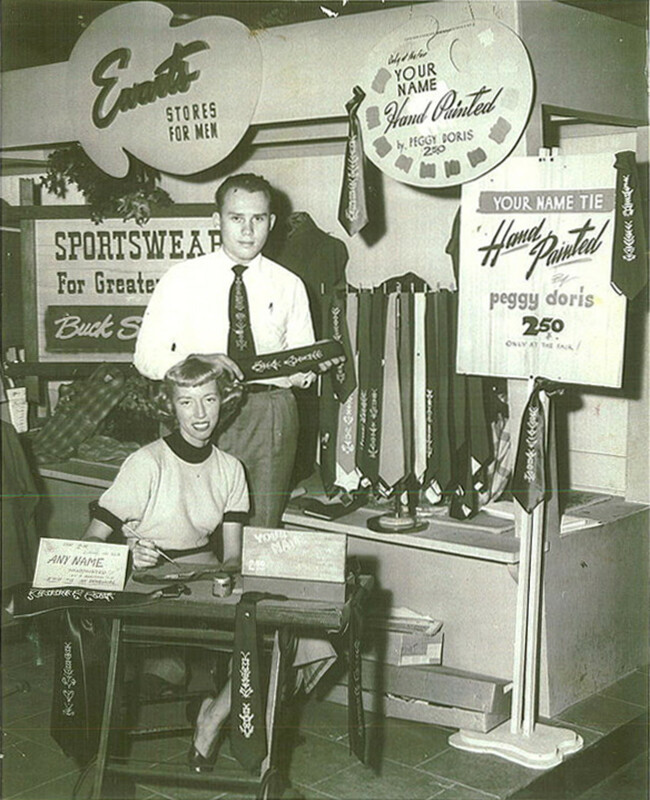 Walter, a savvy businessman, subsequently marketed her work in the form of mass-produced prints, which were sold in myriad department stores, as well as on the back pages of comic books and magazines. Throughout the '60s, the popularity of Keane's "sad-eyed waifs" soared. Two of Margaret's paintings were even featured in the 1962 movie, "Whatever Happened to Baby Jane." In the 1970s, there was a revival, triggered by the 1973 Woody Allen movie, "Sleeper," in which Diane Keaton, when presented with a big-eye painting, exclaims, "It's Keane, it's pure Keane!" 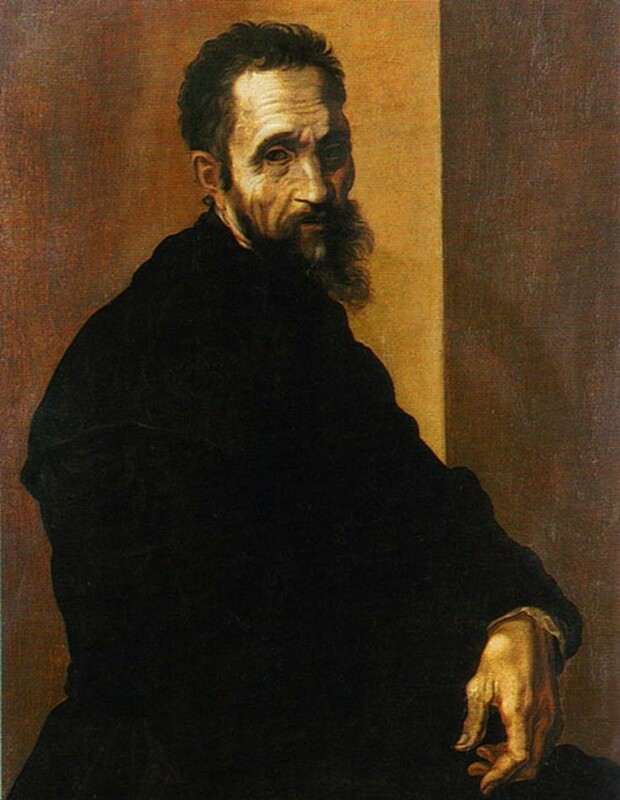 Of course, the whole time all this was going on, everyone thought that Walter was the creator of the paintings! 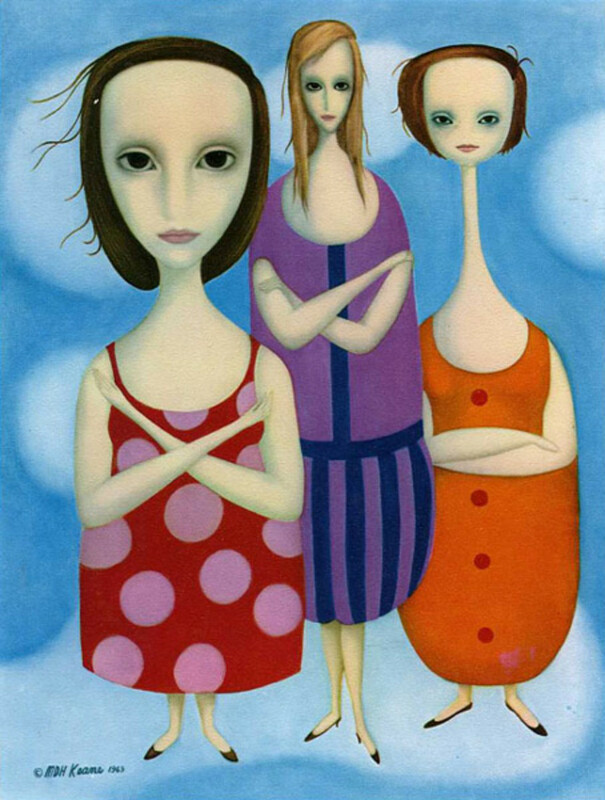 The popularity of Margaret's big-eye kids inspired a slew of copycat artists, who all seemed to suddenly come out of the woodwork. Enter: Gig, Maio, Eden, Eve, Goji, Franca, Lee, Sherle, and more! 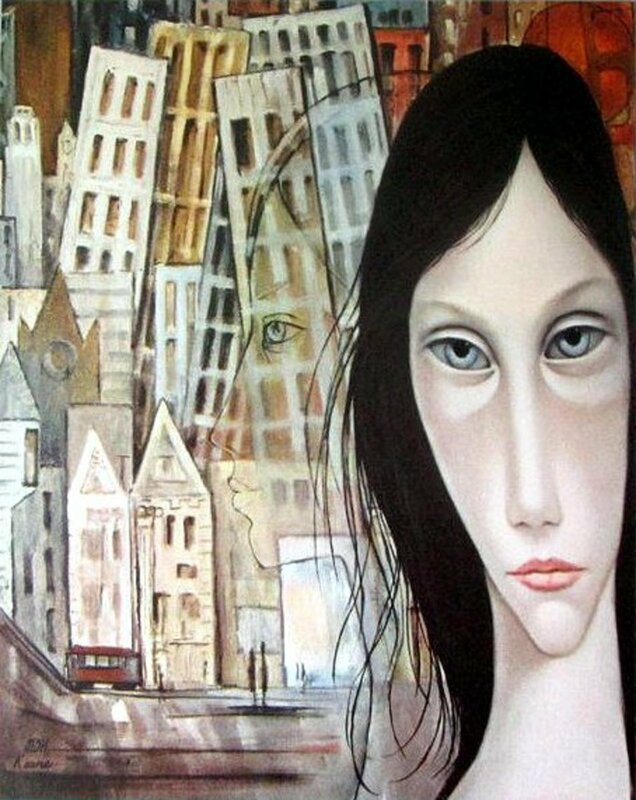 Many of these artists copied Margaret's trademark "sad-eyed waif" look, but some developed their own themes and styles. These artists hailed from a variety of countries, including the United States, the U.K., France, and Italy. Popular themes for big-eye copy-cat artists included: harlequins, homeless waifs, ballerinas, baby-faced sophisticates, musicians, pajama and nightgown-clad cuties, sailors and fishermen, groovy dancers, clowns, "pity kitties," "pity puppies," bears, tigers, and other critters. The second Keane revival, which began in the late 1990s, is ongoing. The fact that Walter took undue credit for creating the paintings that were rightfully Margaret's (Walter claimed the more popular saucer-eyed characters, and Margaret the almond-eyed ones) was no doubt, a major factor in their divorce in 1965. In a radio broadcast In 1970, Margaret announced to the world that she, and not Walter, was the real creator of the paintings, and challenged Walter to a paint-off. Not surprisingly, Walter was a no-show. The dispute continued to simmer over the years, reaching the breaking point in 1984, after Walter accused Margaret of taking credit for the paintings only because she thought he was dead. Margaret responded by taking her ex-husband to court for slander. 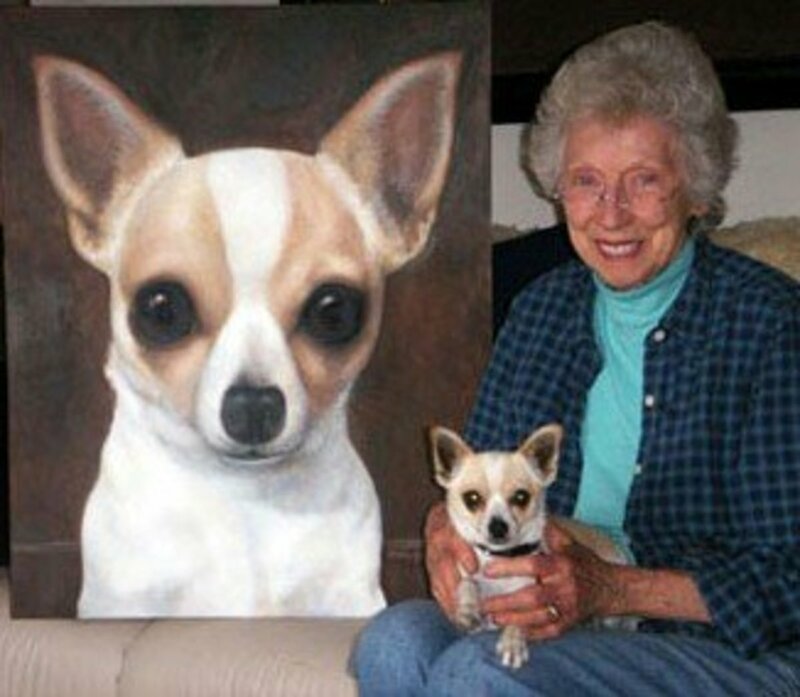 When ordered by the judge to paint a picture of a big-eyed child, Margaret quickly complied, completing her painting in less than an hour, while Walter declined, due to a "sore shoulder," rendering Margaret the victorious winner. Read The Full Story Here. 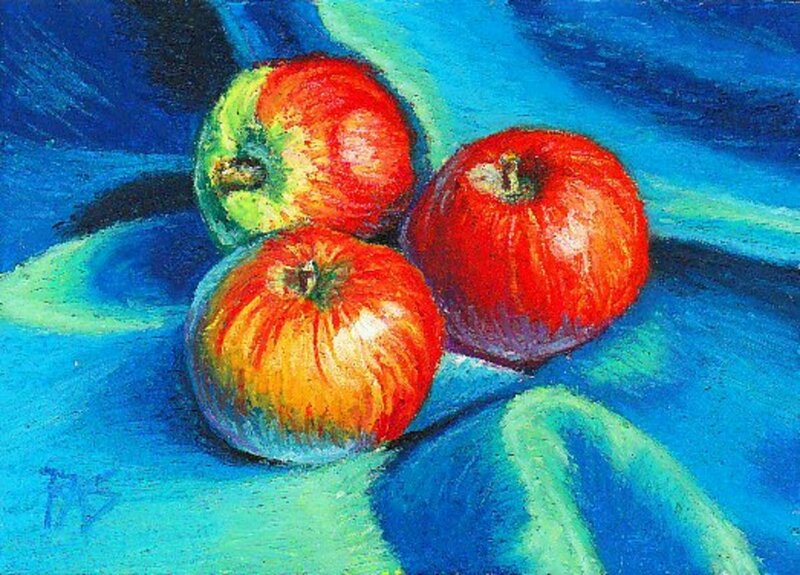 Today, the price for an original Keane can soar up into the thousands. What was once considered low-brow art for the masses is now highly regarded and avidly collected by well-known celebrities. Owning an original Keane is no longer scoffed at--in fact, it has become a status symbol--that is, for those who can afford one! Celebrity Keane collectors include: Matthew Sweet, Marilyn Manson, Jerry Lewis, Robert Wagner, Tim Burton, and the late Dinah Shore, Liberace, Zsa Zsa Gabor, and Dean Martin. 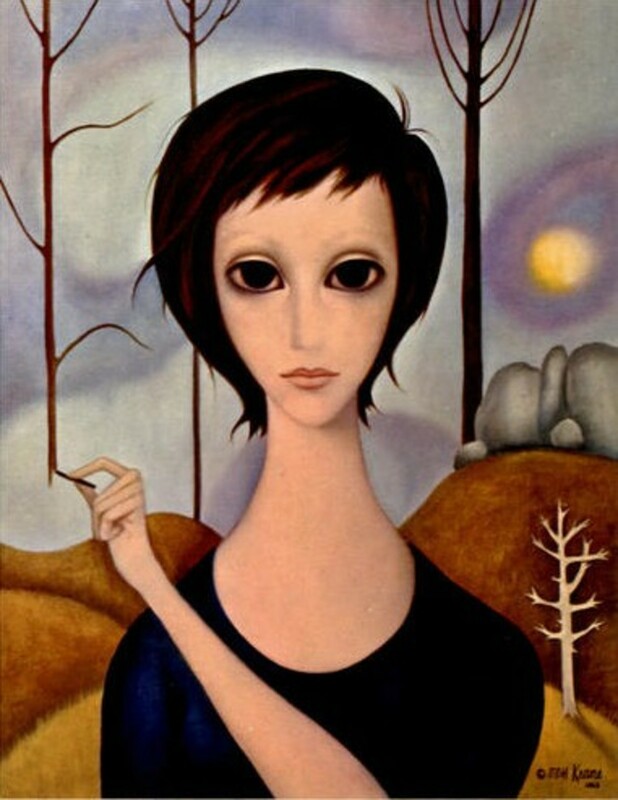 Don't let Margaret Keane's quiet demeanor fool you--introspective and humble, Margaret has a constitution of steel. 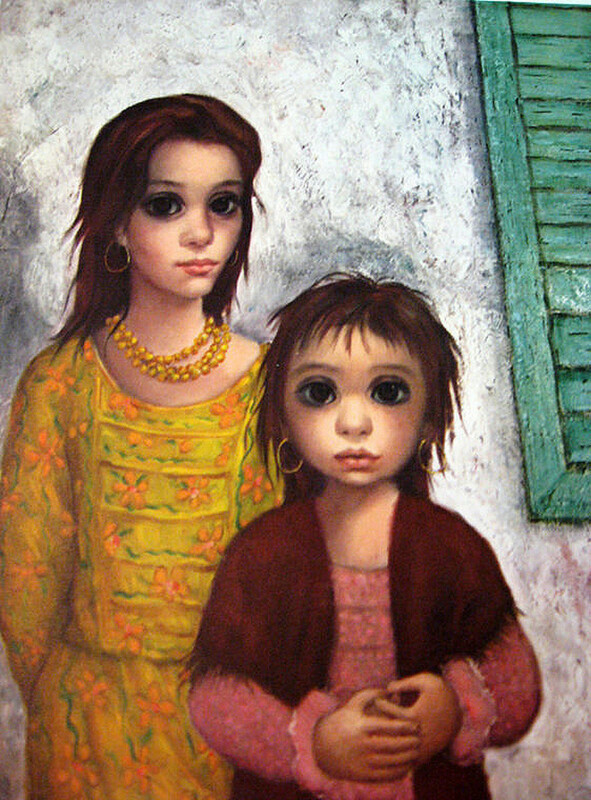 Margaret Keane has endured more than her share of anguish and disappointment in life, starting from early childhood. But, like the proverbial cat with nine lives, Margaret always manages to land on her feet, emerging from each setback even stronger and more determined than before. Margaret's perseverance and faith in God have seen her through many a rocky road. 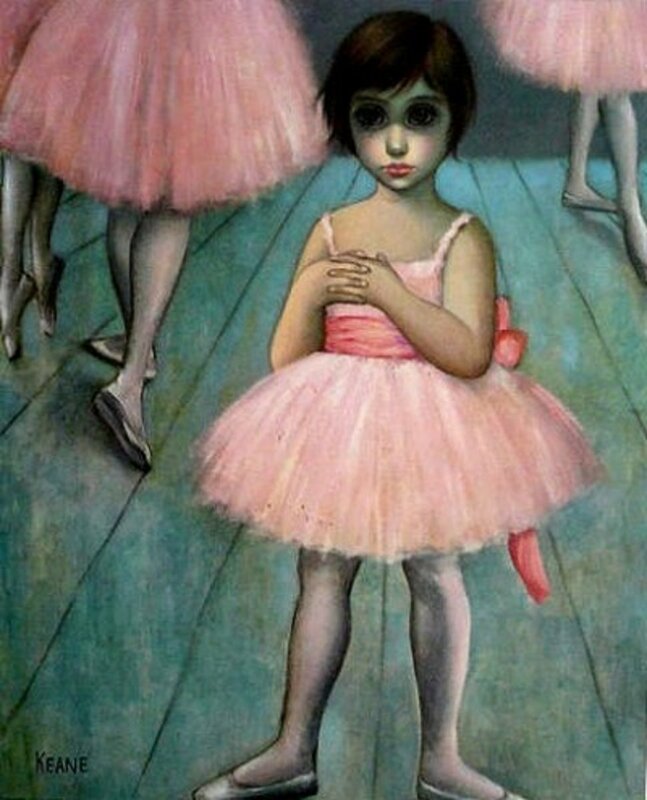 At the time of her marriage to Walter, her paintings very much reflected her feelings of hopelessness and desperation. 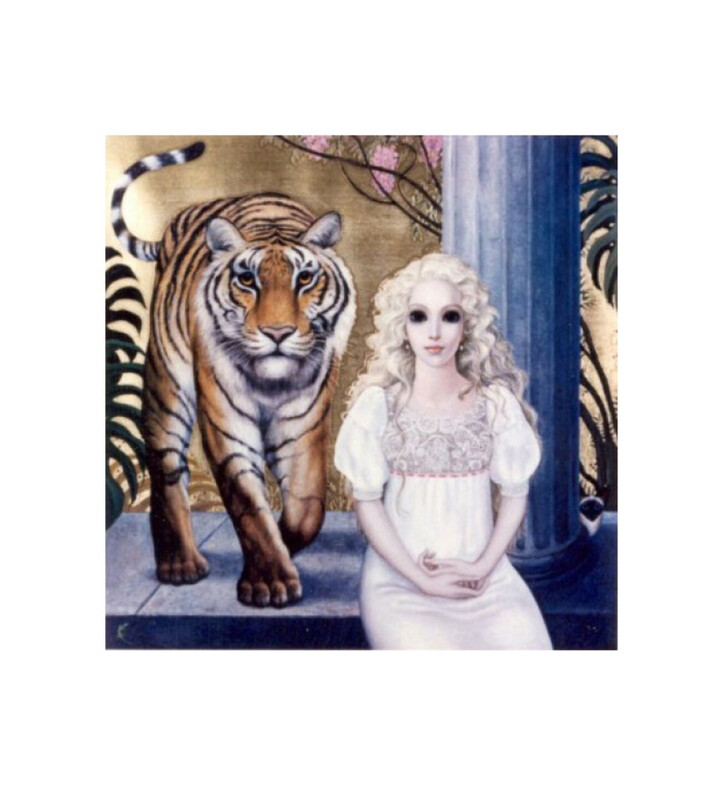 Read about it here in Margaret's own words: "Margaret Keane: My Life as a Famous Artist." 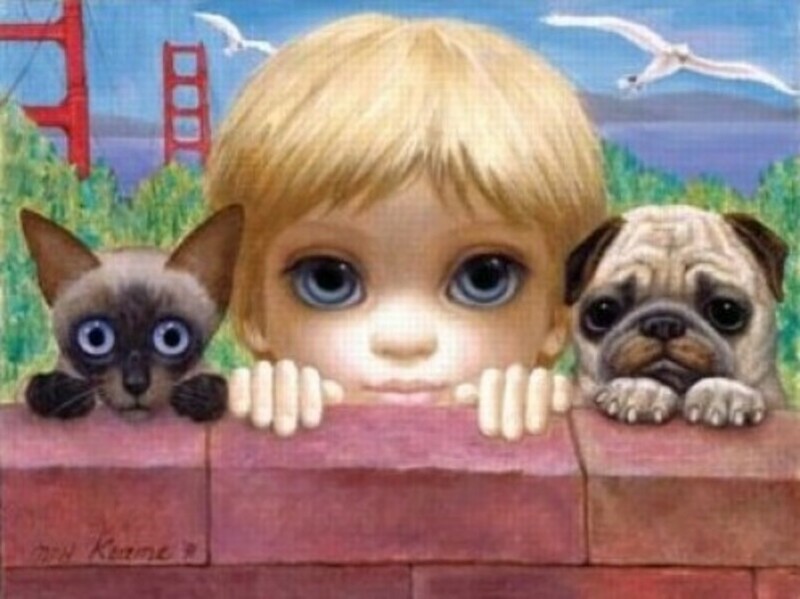 Do You Have Any Margaret Keane Art on Your Walls? 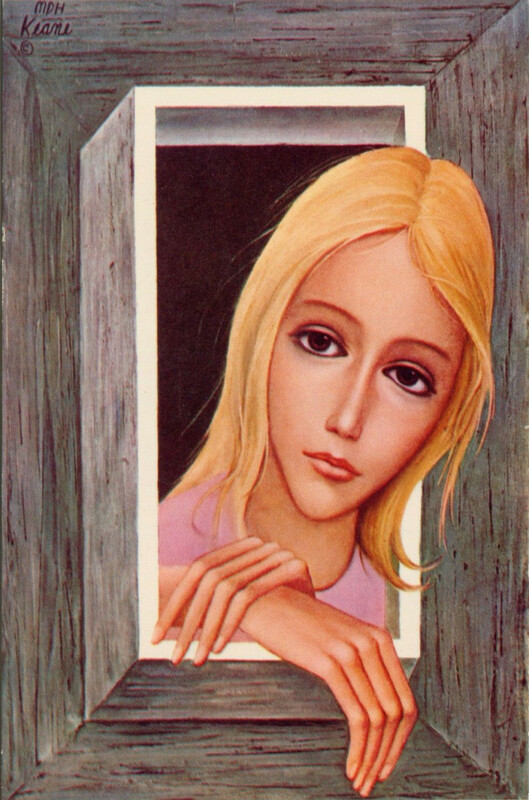 There's not a lot of information out there about Margaret Keane. This book provides more details into Margaret's upbringing and character, what influences her work, and how and why her work has evolved over the years. 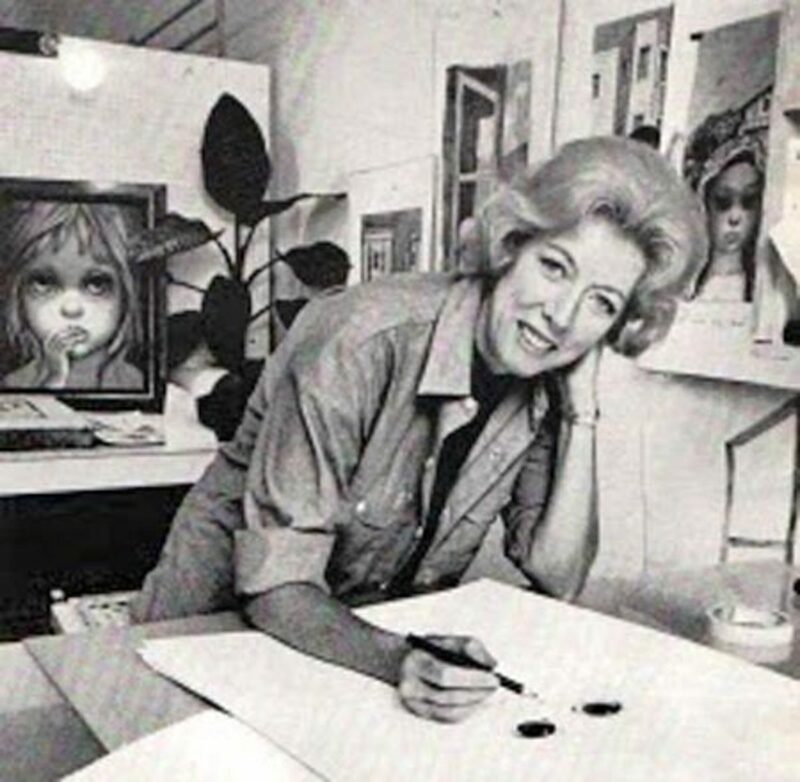 Margaret and Walter Keane were a very successful team in the 1960s and '70s, pulling six figures yearly, which was a big sum of money in their day. In the public's eyes, the Keanes seemed to have the kind of life most people could only dream about: money, prestige, and fame galore. But behind closed doors, Margaret was suffering deeply; in order to express herself, she transferred her feelings to canvas, painting desolate and crying children. The public had no inkling of the the heart-breaking and shocking secrets that were being hidden behind closed doors at the Keane house. 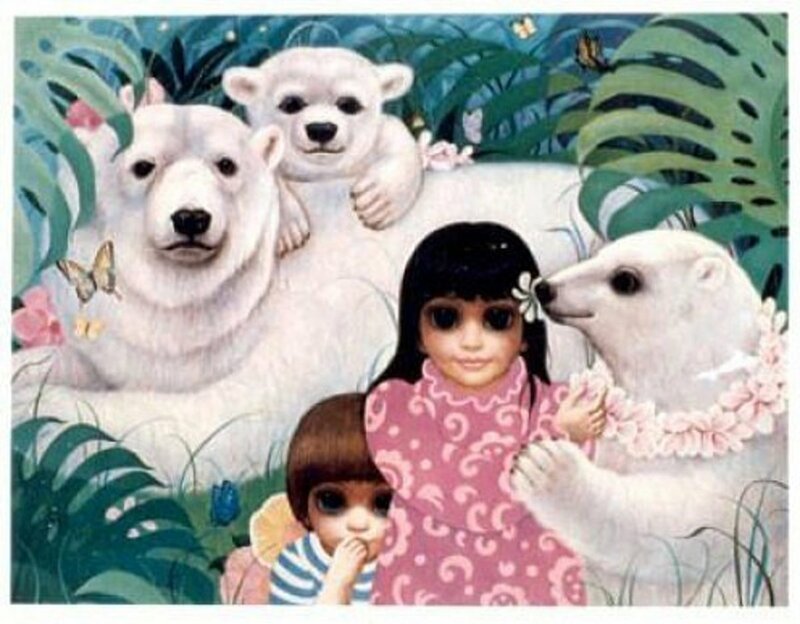 Read more about it here: "Margaret Keane: The Lady Behind the Big-Eyed Kids." 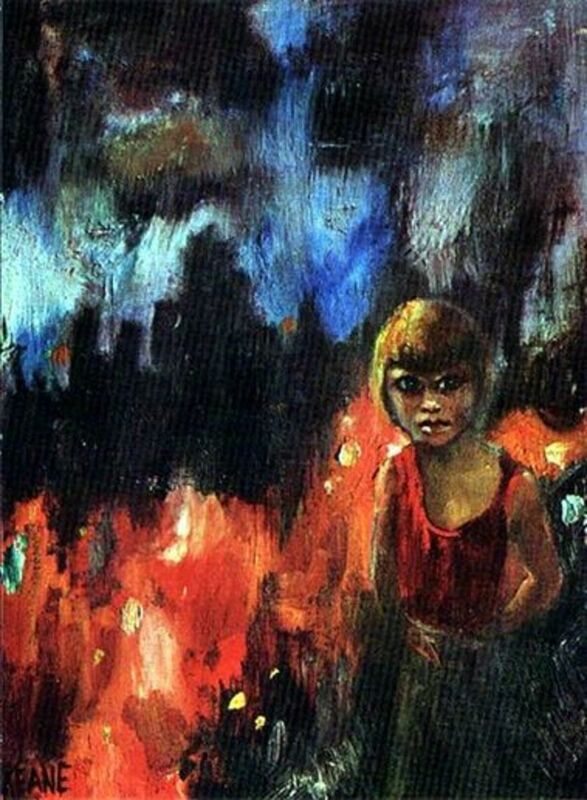 This painting, appropriately named "Survival," depicts a child desperately searching for a way out as burning fire and billowing smoke engulf him. In creating this painting, Margaret seems to be expressing her own emotions of hopelessness, helplessness, and desperation after enduring years of pain and abuse at the hands of Walter. 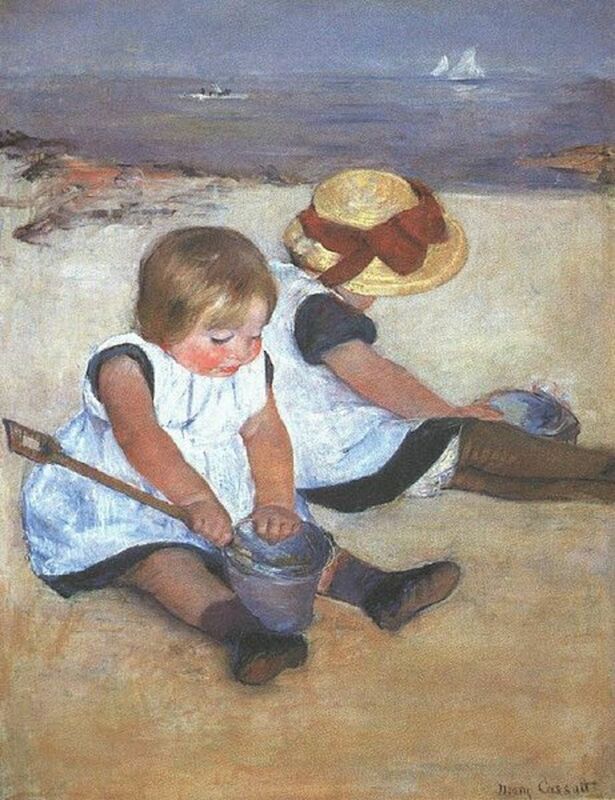 The painting was created shortly before their divorce in 1965. 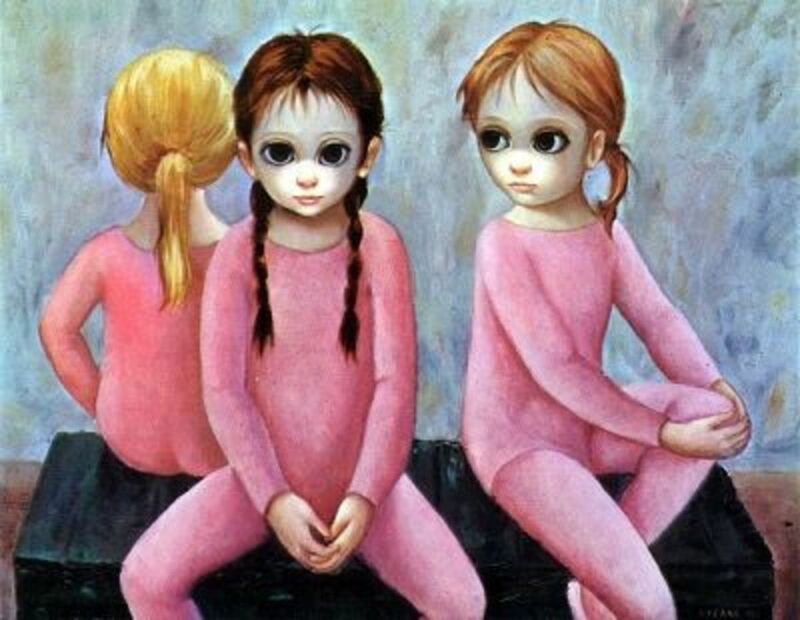 Margaret Keane's big-eye "children" have undergone many transitions throughout the years, reflecting her own life. At first, the children were desolate, lonely, and often crying. Over the years, as Margaret changed, so did her "children." 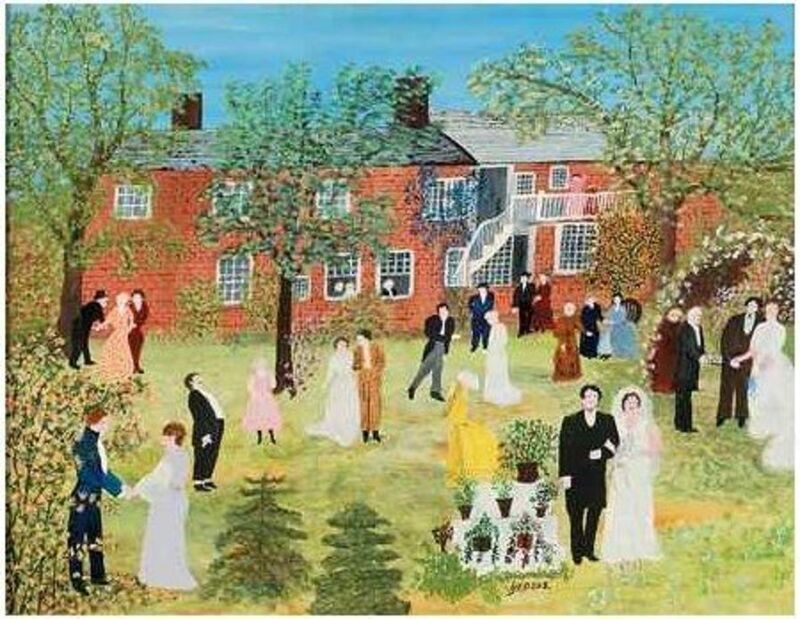 During her marriage to Walter, Margaret was forced to create paintings behind locked doors so no one would ever know that Walter wasn't the true artist. Walter, who professed to having Mafia connections, threatened to have Margaret and her daughters knocked off if she failed to comply. Margaret was scared to death. Margaret's life changed for the better when she divorced Walter, in 1965, and moved to Hawaii. When she proved in court that all of the paintings were done by her, it empowered her, giving her hope for the future. In 1974, when Margaret became a Jehovah's witness, it totally changed her life, giving her strength and courage. Margaret changed from shy and fearful to outgoing and even talkative. Notice the changes in the children? As Margaret became happier, so did the children. What about their surroundings? Notice how dingy, dark, and depressing changed to sunny, bright, and happy? Margaret's "children," like her, were sad and desperate. As Margaret found hope and happiness, so did the children. Her website now advertises her work as having "tears of joy" or "tears of happiness." 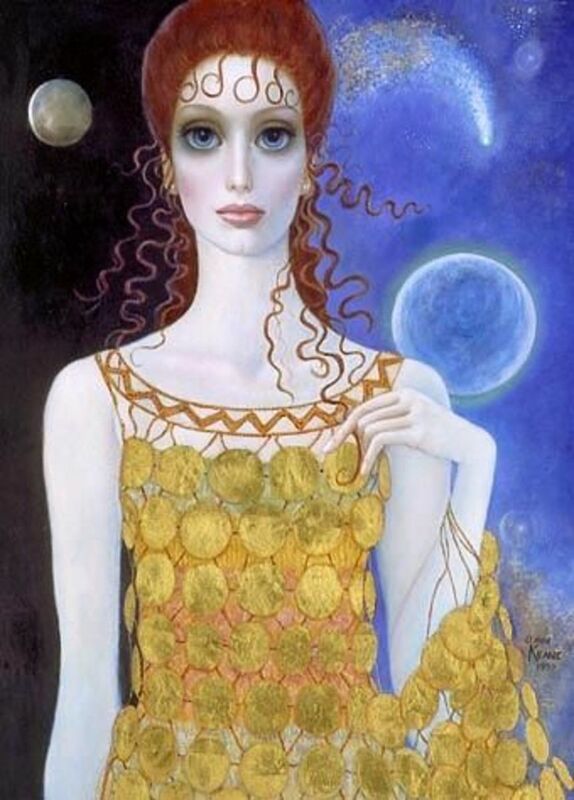 In 1999, Margaret Keane painted high fashion portraits of girls draped in clothing designed by Oscar de la Renta, Christian Lacroix, Carolina Herrera, Dolce & Gabbana, Gianfranco Ferre, and John Galliano. The fashions could be purchased in stores such as Saks Fifth Avenue Bergdorf Goodman, and Neiman Marcus. All of the girls sported those fabulous voluminous eyes which are Margaret's trademark. 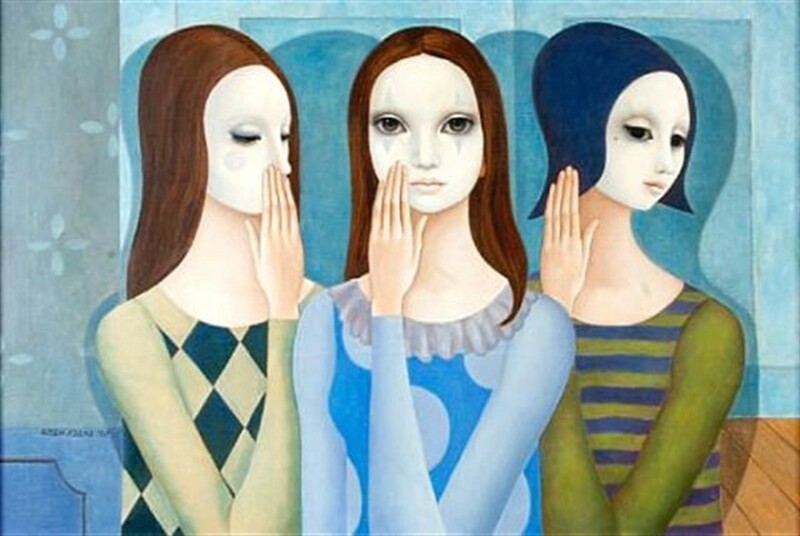 Margaret Keane's art is a hot commodity among celebrities, who have avidly snatched it up over the years. Some famous folks have even gone a step further by commissioning Keane to capture their essence in her trademark goggle-eyed style. One such celebrity who had the honor of becoming immortalized in Keane's saucer-eyed style is the late Natalie Wood, former child star and glamorous Hollywood movie star of the 1950s--1980s. 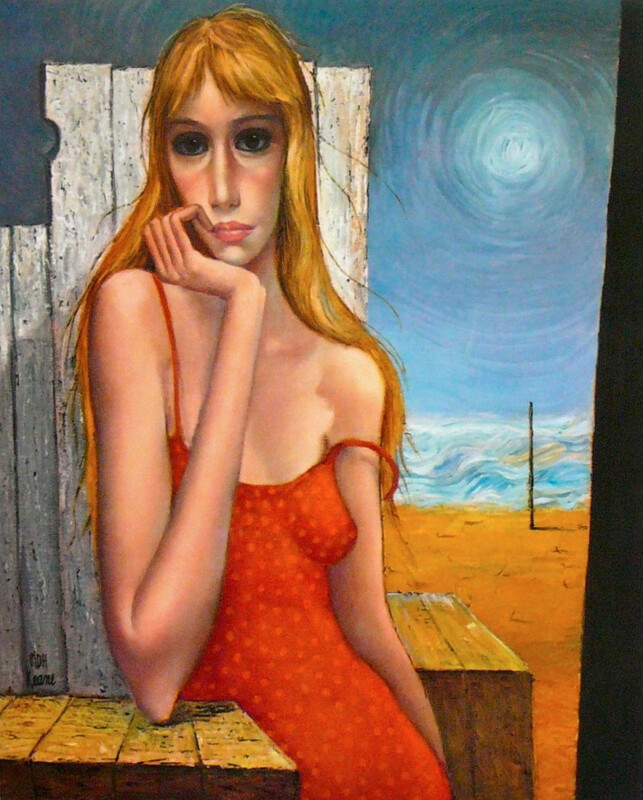 Wood, who first became obsessed with Margaret Keane's sad-eyed waif paintings in 1959, commissioned Keane to paint portraits of her at different stages of her life--as a pigtailed child clutching her dog, and, as a glamorous movie star of 21. 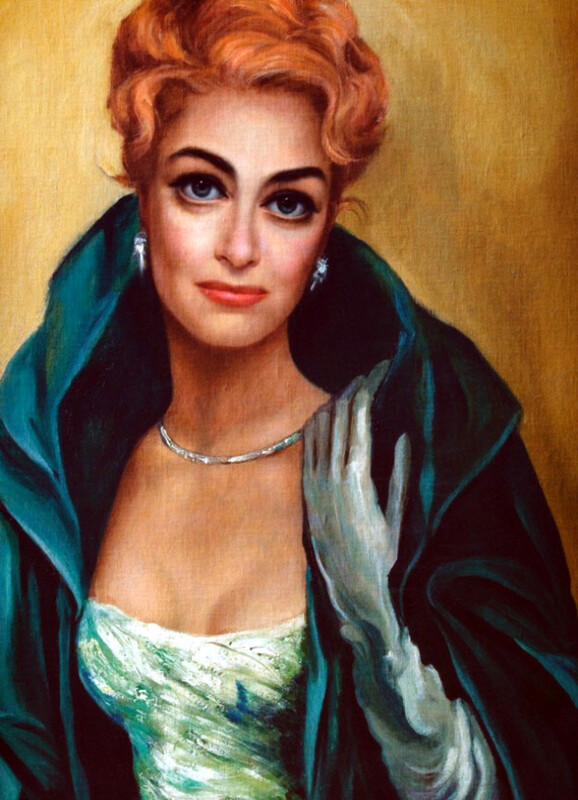 Other celebrities immortalized by Keane include: Joan Crawford, Kim Novak, Jerry Lewis, and Tim Burton's former girlfriend, Lisa, and her dog, Poppy. 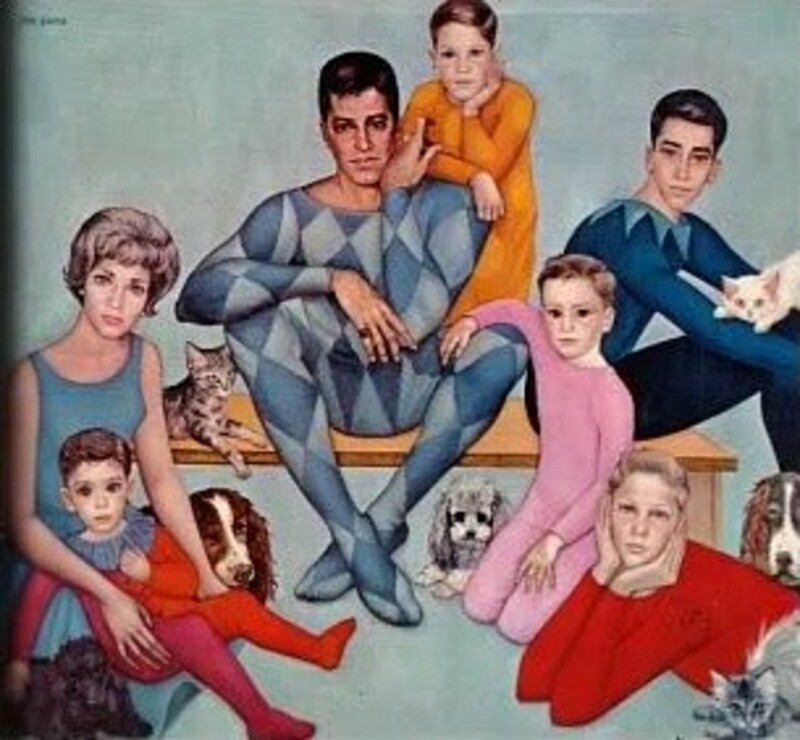 In keeping with his profession as a comedian, Margaret Keane opted to paint the Jerry Lewis family as harlequins. The painting took two months to complete. 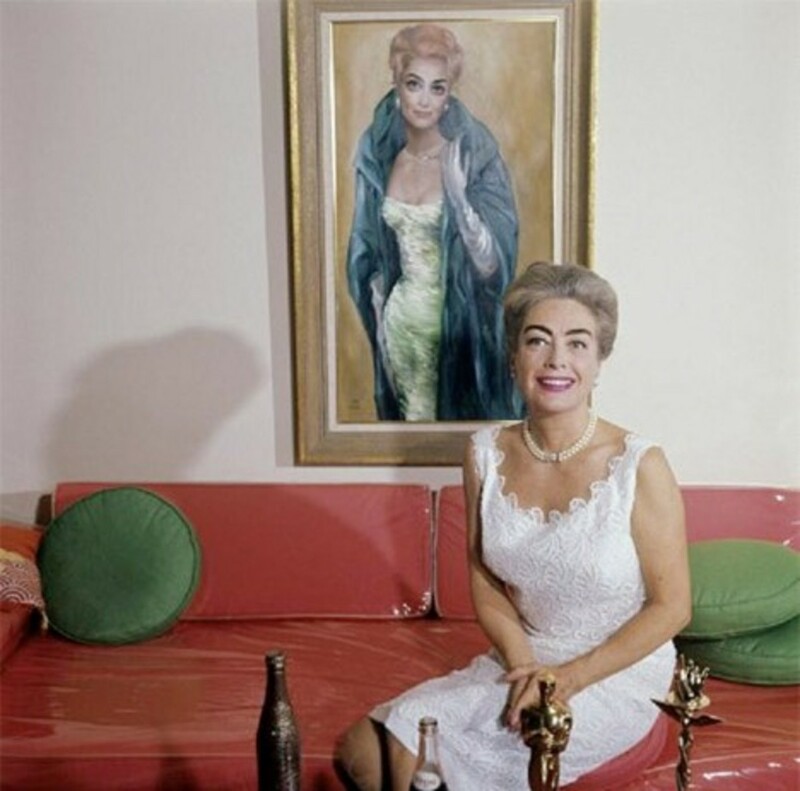 Joan Crawford's Keane Painting--Destroyed by a Mystery Person? There's an interesting story behind the late Joan Crawford's portrait: Joan, an admirer of Keane's work, organized a star-studded opening for the Keanes in New York. Later, Crawford featured two of Margaret's paintings in her movie, "Whatever Happened to Baby Jane." 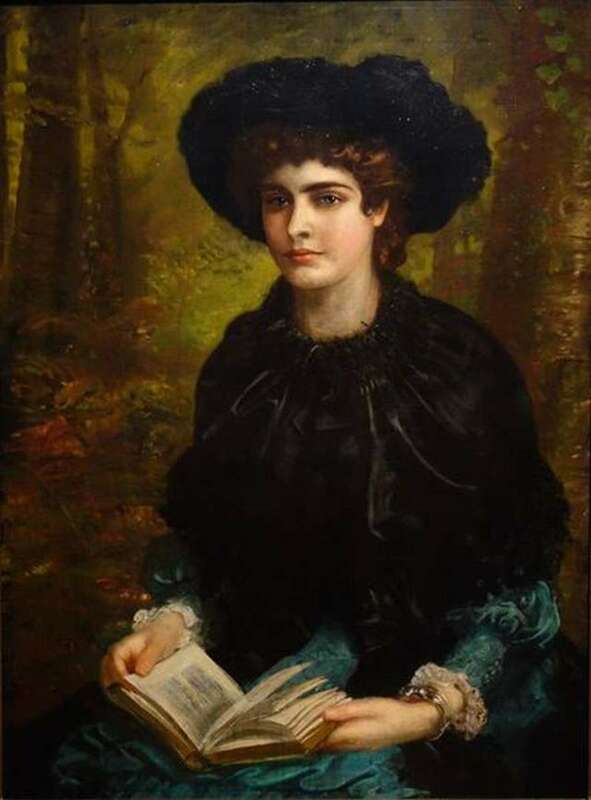 When Crawford commissioned Margaret to paint her portrait, she later added a picture of it to the cover of her autobiography. Strangely, the last time the portrait was seen by Margaret, it had been mysteriously scratched beyond repair. Two unanswered questions remain: who did it and why? This book is pricey and hard to get, but, according to its faithful readers, very well worth it. Crawford's autobiography has been added to my to-read list! Who is your favorite retro big-eye artist? 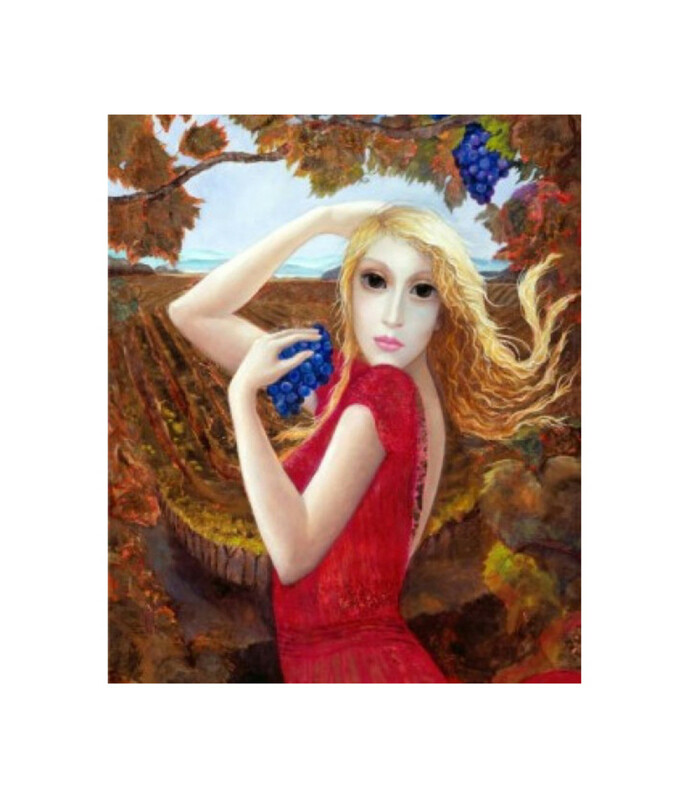 Did you know that Margaret's talents were put to work designing a label for a wine bottle? 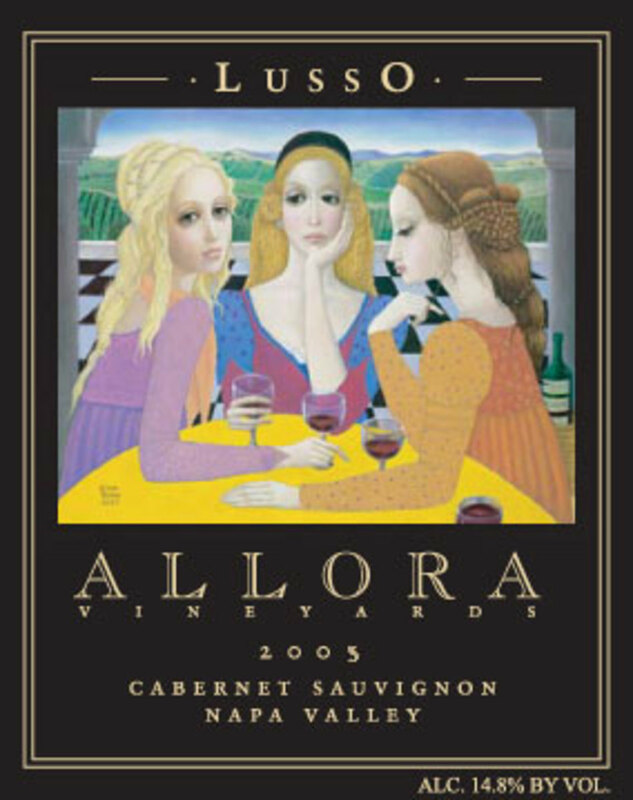 The label was created for Allora Vinyard's Lusso Wine. This rare design showcases Margaret's talent for fashion and style. The Medieval style costumes and hairstyles are fabulous! 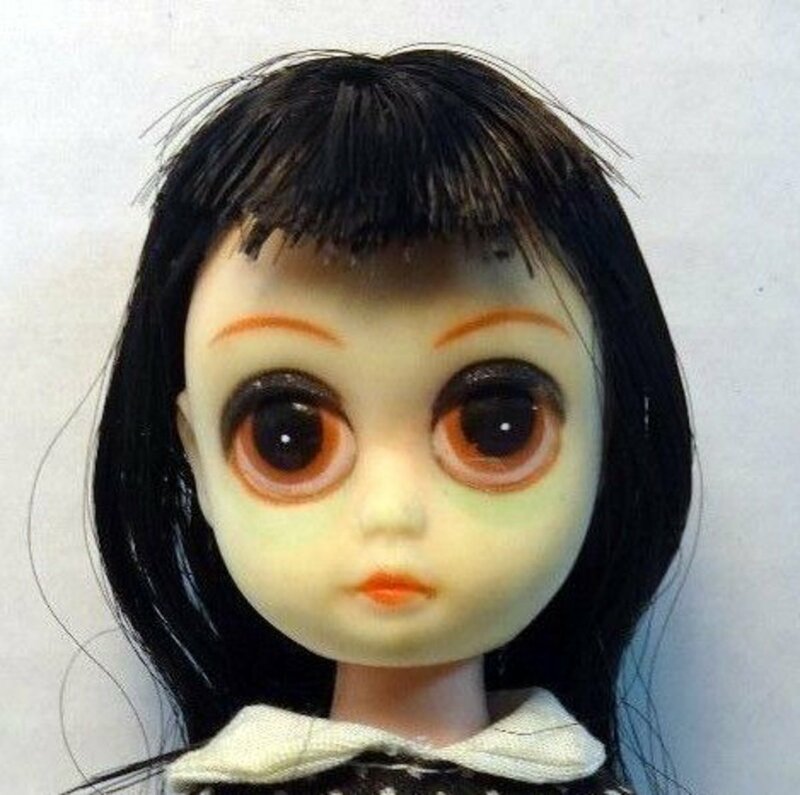 In the 1960s and '70s, big-eye dolls inspired by Margaret Keane's saucer-eyed waifs were produced; most notable among these are Susie Sad Eyes, Little Miss No Name, and Blythe. 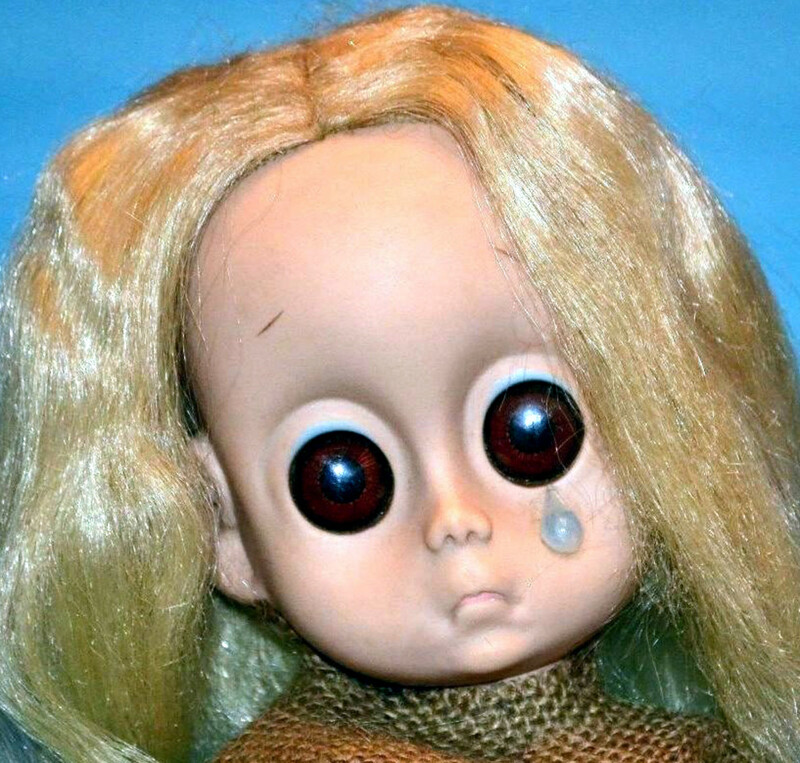 With gargantuan dark, brooding eyes, Susie Sad Eyes is the doll that most resembles Margaret's sad-eyed waifs. She is a small doll (only eight inches), but makes a big impact with her disturbing and hypnotic eyes. Little Miss No Name is a pitiful barefoot orphan doll wearing a burlap dress and a tear. She's rather scruffy and scary-looking, so it takes a special person to love her. Due to her revival in 2000 by photographer/ producer Gina Garan, Blythe is the most famous of all, and my personal favorite. She was originally produced for one year only--1972, and wasn't popular then. Today, she is extremely popular, and is even being reproduced by Takara of Japan. Vintage Blythe dolls don't come cheap, so you may want to opt for the less expensive Blythe reproduction dolls, which come in both regular size and mini. 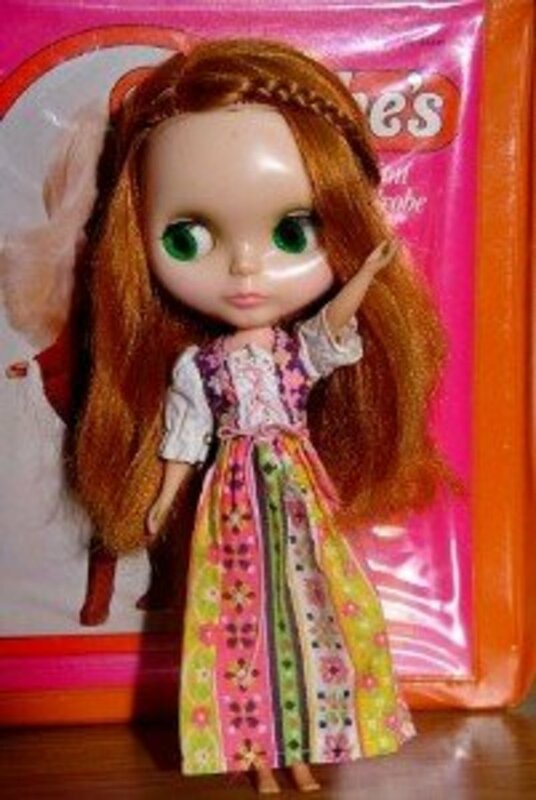 Also check Amazon.Com for Blythe reproduction dolls for sale by Ashton Drake. 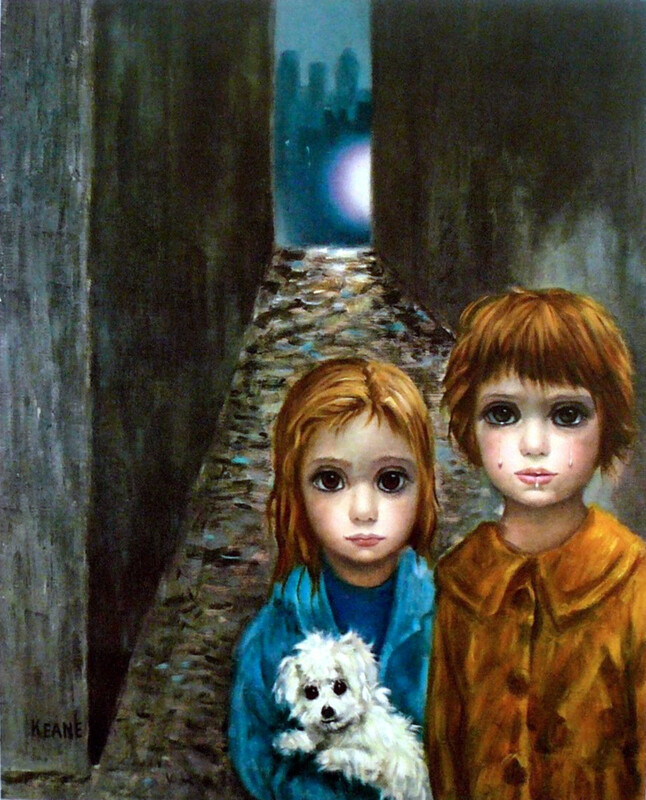 Margaret Keane, who was born in Tennessee in 1927, is still painting today, but in a different way--her style has changed from "sad and weepy" to "sunny and optimistic," a reflection of the happiness she has discovered since divorcing Walter and becoming an active Jehovah's Witness. The children are no longer emaciated and desolate. They're happy, they're healthy, they're positively beaming! The children no longer cower in filthy alley ways or timidly peek out of abandoned buildings. They now live in a world of perpetual sunshine, fun, and frolic--where trolley cars, rainbows, hot air balloons, and friendly wild animals take them anywhere their little hearts desire. RIP sad-eyed waifs. 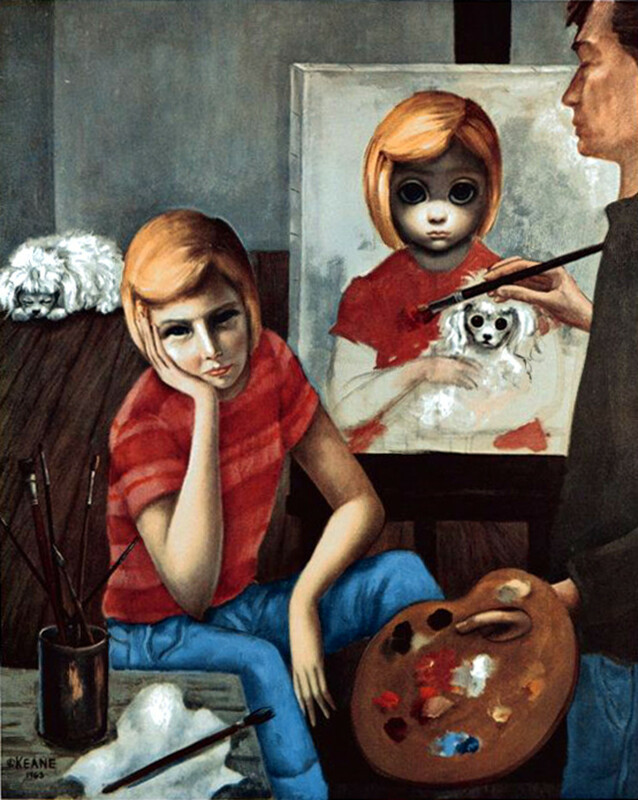 The influence of Margaret Keane's art is still evident more than fifty years after the debut of her first big-eye painting. 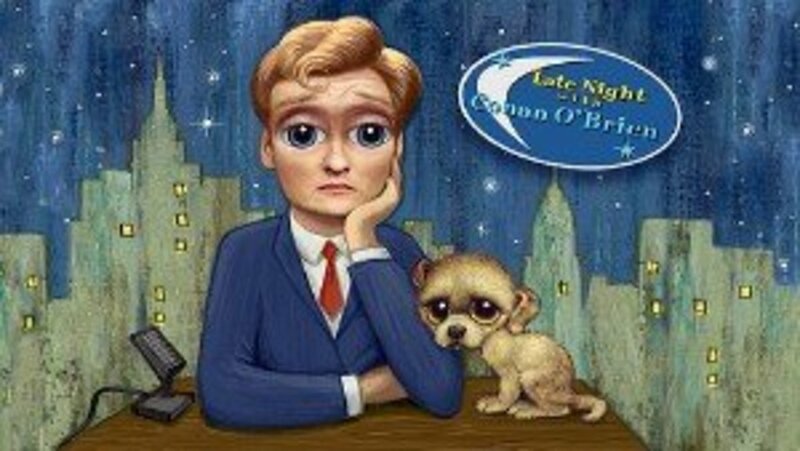 When Conan O' Brien got a new puppy, "bumper" art was posted (in goggle-eyed Keane style) on his show, Late Night with Conan O'Brien, depicting a glum O'Brien at his desk with an equally glum dog. 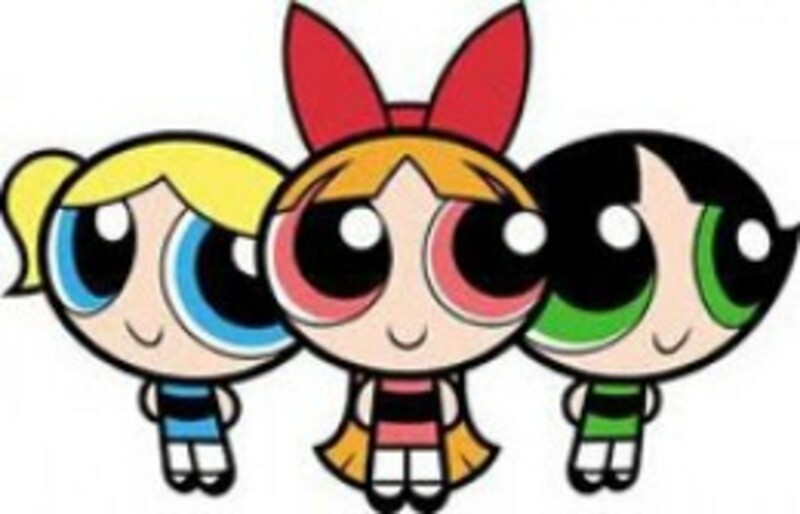 Animator Craig McCracken's popular Powerpuff Girls were partly inspired by Keane's sad-eyed waif paintings. Oddly enough, the girls' schoolteacher is appropriately named "Ms. Keane." 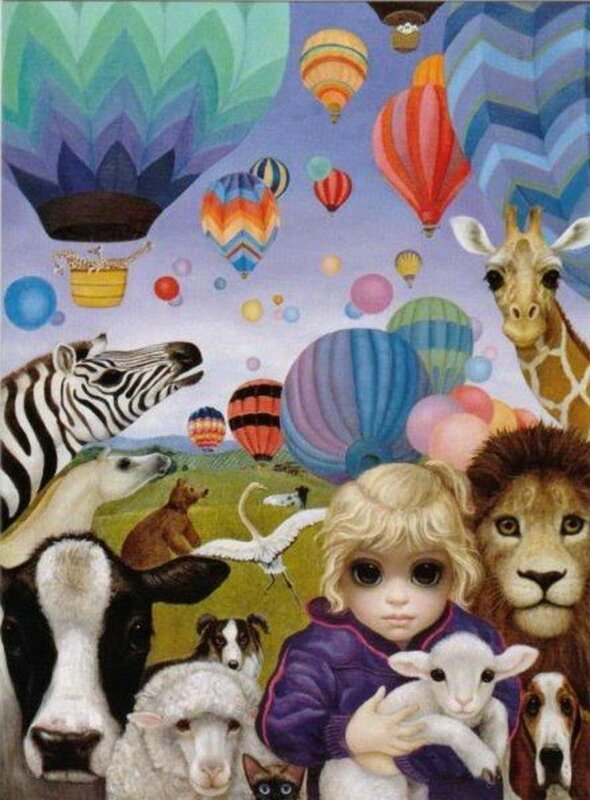 Margaret Keane's paintings may be found in public collections all over the world: Hawaii State Capitol, Honolulu; the National Museum of Western Art, Tokoyo; National Museum of Modern Art, Mexico City; the National Museum of Contemporary Art, Madrid; Musee Communal Des Beaux-Arts, Bruges; Brooks Memorial Museum, Memphis, Tennessee; Tennessee Fine Arts Museum, Nashville, Tennessee; the United Nations, New York City and others. 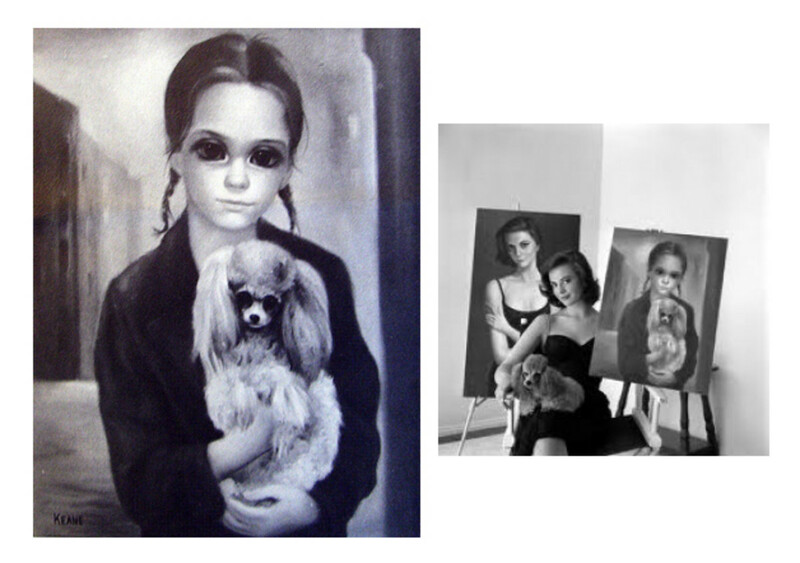 Keane's work has been featured in many one-artist shows around the world: National Museum of Contemporary Art in Madrid; the Brussels Pavilion at the Brussels World's Fair, by special invitation of the Belgian government; Tokoyo American Cultural Center in Tokyo, sponsored by the U.S. State Department, as well as galleries in Chicago, New York, San Francisco, Honolulu, Beverly Hills, and more. After exhibiting in three annual juried shows in the M.H. De Young Memorial Museum in San Francisco, Margaret Keane was honored with the title of Fellow of The Society of Western Artists. "I think what Keane has done is just terrific. It has to be good. If it were bad, so many people wouldn't like it." Vicki Berndt creates retro-style portraits of friends and famous people that bear an uncanny resemblance to a Keane original. Her celebrity portraits, although big-eye caricatures, are amazingly accurate portrayals of these pop culture icons. Courtney Love, Deborah Harry from Blondie, and Belinda Carlisle from the Go-Go's are among my favorites. Misty Benson shrouds her big-eye characters in surreal settings with Gothic overtones. 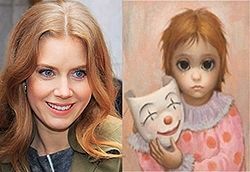 Her "morbidly adorable" paintings typically feature girls sporting gargantuan Kean-esque eyes with a devilish gleam in them. Favorite subjects include skeletons (she calls them "skellies") with huge eye sockets, fairies, witches, mermaids, day-of-the-dead, ghostly and devilish beings, and other decadently fun and creepy characters. 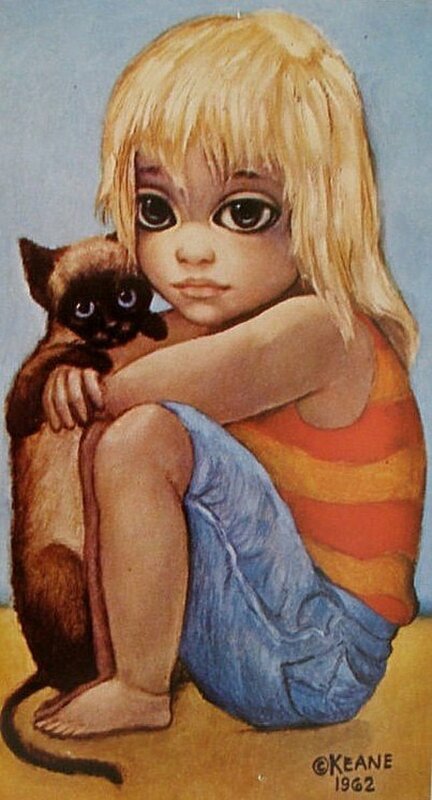 Blonde Blythe draws her influence from Margaret Keane's vintage portraits of children, as well as the Blythe doll, a changing-eye doll that was first produced in 1972. 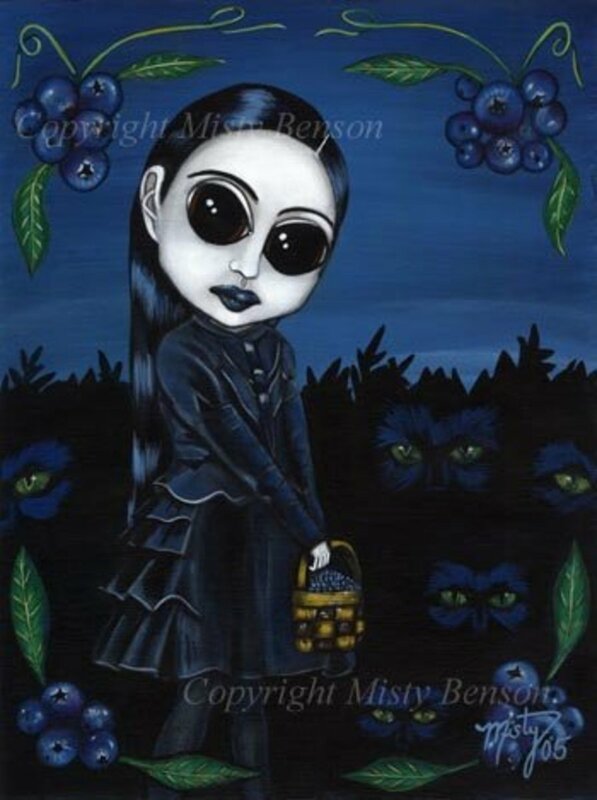 She creates mostly kawaii (cute) style paintings, but has also been known to create kawaii noir (cute & dark) style paintings, especially for Halloween. 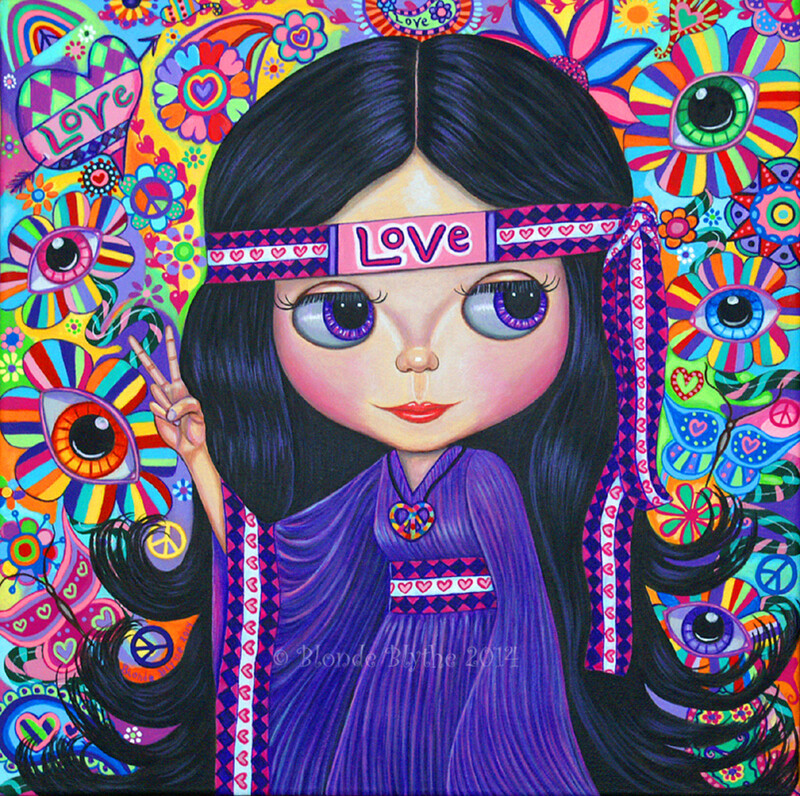 Her most popular images to date are her psychedelic hippie girls. Carrie Hawks creates fantasy cat art with an undeniable Keane feel. 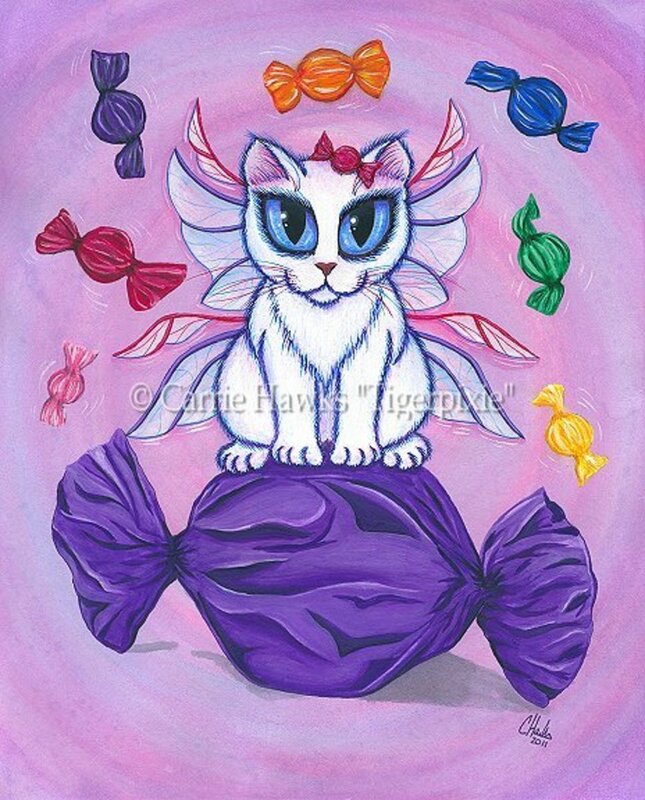 Her feline cuties typically sport wings or mermaid tails, and she has also created cats all decked out in Victorian finery (for her steampunk art), ghost cats, Egyptian cats, bird cats, and pirate cats. Hawks' vampire cats, sometimes shrouded in Dracula-style capes, flash glowing eyes and menacing fangs while haunting gloomy graveyards. 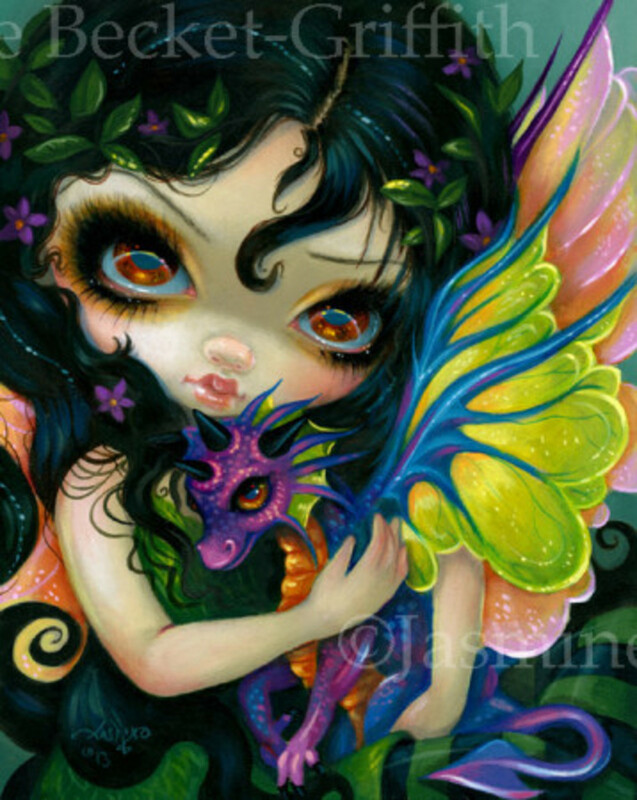 Jasmine Becket-Griffith, known world-wide for her big-eye fantasy art, typically creates fairies and mermaids in a Gothic style, as well as other interesting subjects: nymphs, fairy tale characters (Alice in Wonderland, Rapunzel, Snow White, Wizard of Oz), dragons, rococo beauties, and infamous characters such as Countess Bathory (the blood countess) to name a few. 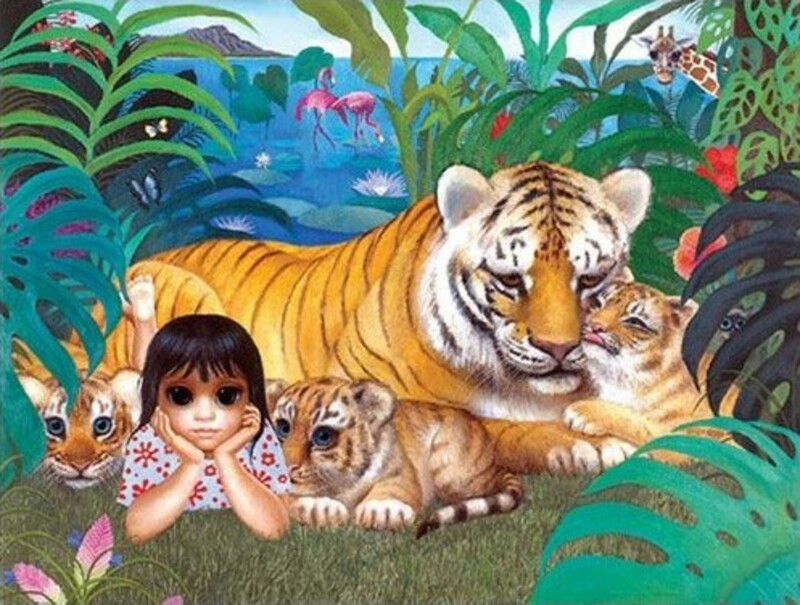 Jasmine was influenced early on by fantasy art as well as the work of Margaret Keane. 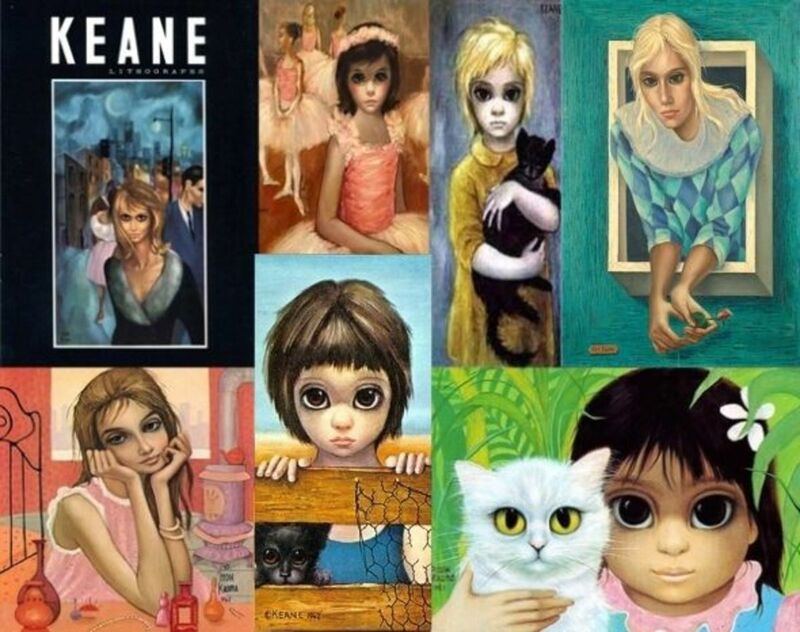 She first discovered Keane's art in the form of big-eye prints advertised for sale in the back of old comic books that her Mother had saved, and was instantly smitten. Jasmine's work is licensed worldwide in the form of posters, sculptures, jewelry, tee shirts, dolls, ornaments, car accessories, and other fun items. She has created exclusive big-eye characters for Disney, Hamilton Mint, Aston Drake, and other companies. Vicky Knowles Creates her very own world of Keane-style fantasy creatures called "Wibbley World." 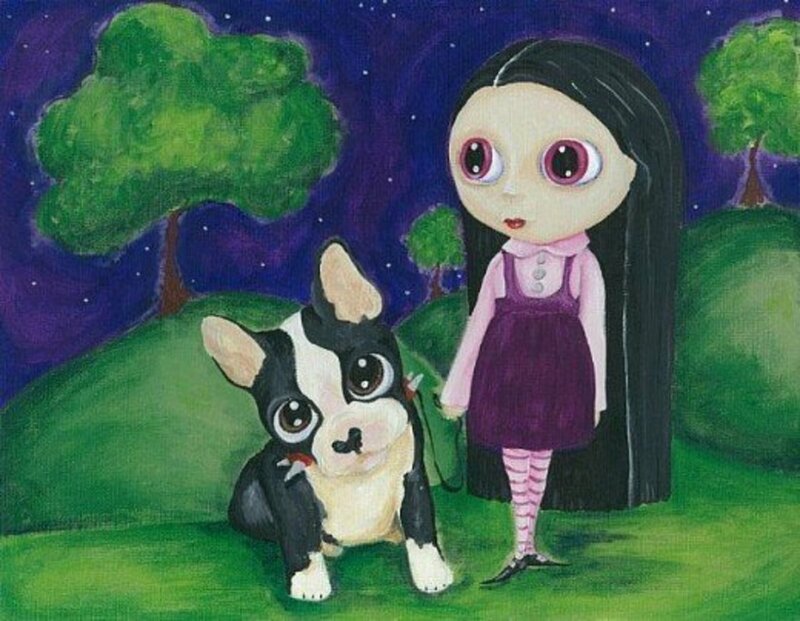 Her wall-eyed Boston terriers, who smile at you with a toothy grin, have all sorts of adventures in fun and unusual settings, such as boxing rings, school yards, and even graveyards on Halloween night. Knowles' genius and imagination can been seen in her other unique characters, as well. Her depictions of elephants, squids, cats, dogs, bunnies, caterpillars, and other interesting creatures, are very fresh, very kawaii, and very unique. Alexandria Sandlin delights in combining the innocence of fairy tale art with Gothic or sinister overtones. 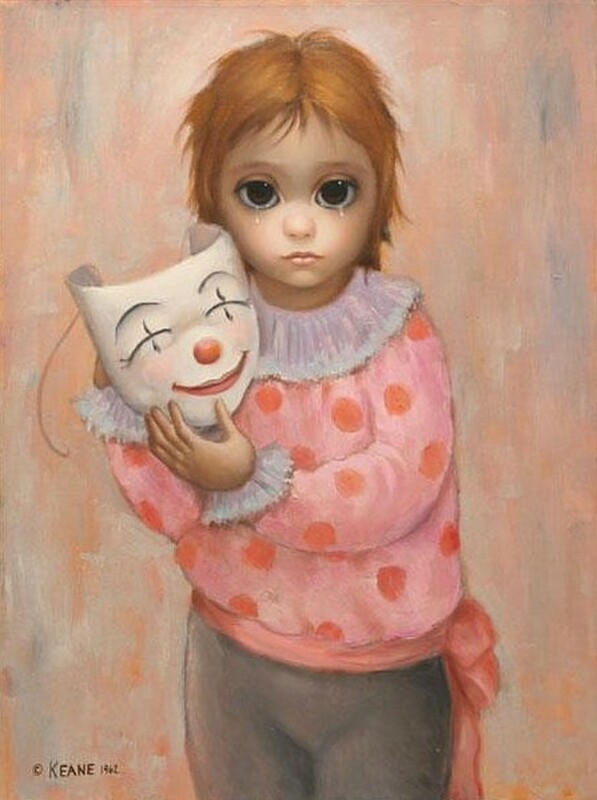 Although her art may seem sweet and innocent on the surface, the viewer must contemplate the work and look beneath the surface--for what you see may be merely an illusion. Noelle Hunt's outsider/ folk art style, colorful and bold, is a combination of our favorite big-eye artists of the '60s, with a twist. 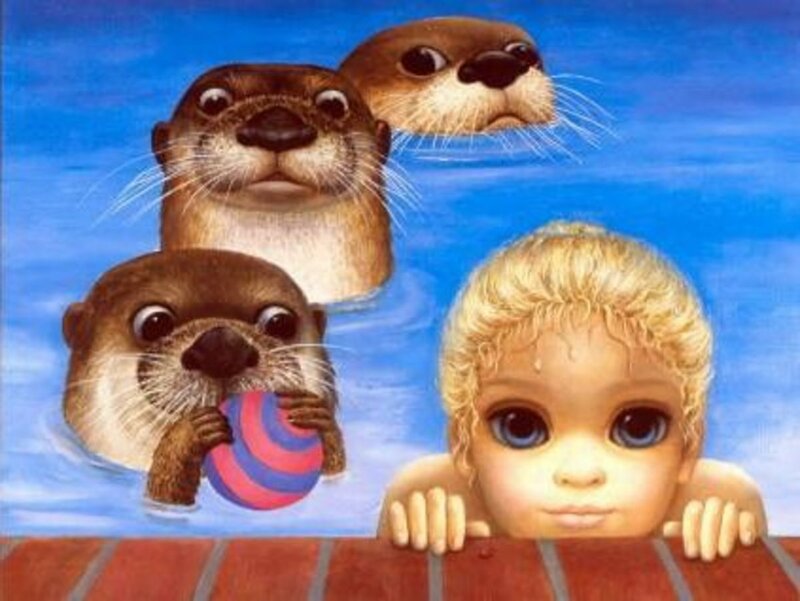 From her Blythe doll portraits, to her adorable animal art, the eyes of her subjects are captivating and poignant, and her work is delightfully kitschy. 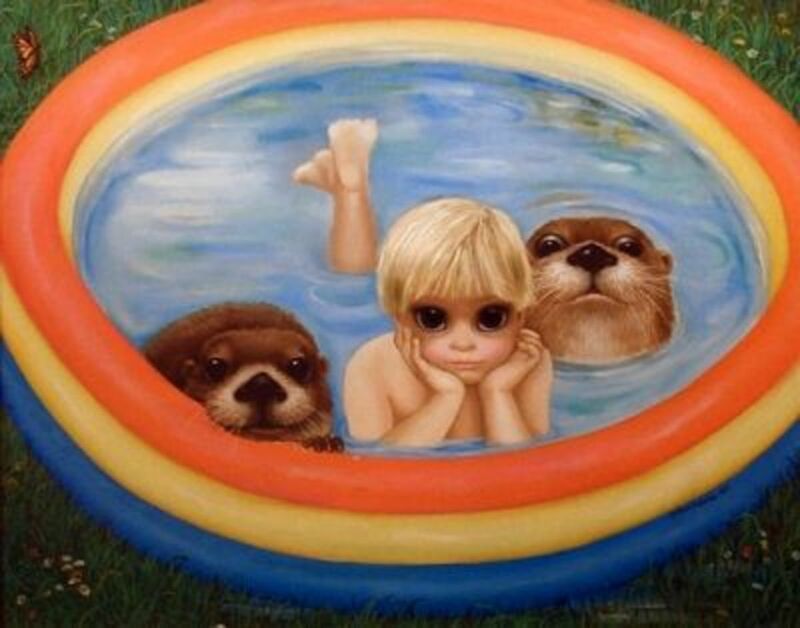 Information for this lens has been obtained from several sources; to peruse all references, click on the many Margaret Keane links provided on this lens, in link lists as well as in text modules. If You're a Big-Eye Art Lover, This Book is a Must-Have! This book has something for everyone! Featuring the art of twenty-two visionary artists, you will never get bored, and will be absolutely amazed and delighted at the diversity of these big-eye wonders! The foreword is written by world famous fantasy artist Jasmine Becket-Griffith, who also contributes her lovely art. Jasmine is licensed by Disney, Hamilton, Ashton Drake, and many others, thrilling her fans the world over by her many public appearances. "I love to do eyes, so I think I'll always do eyes." 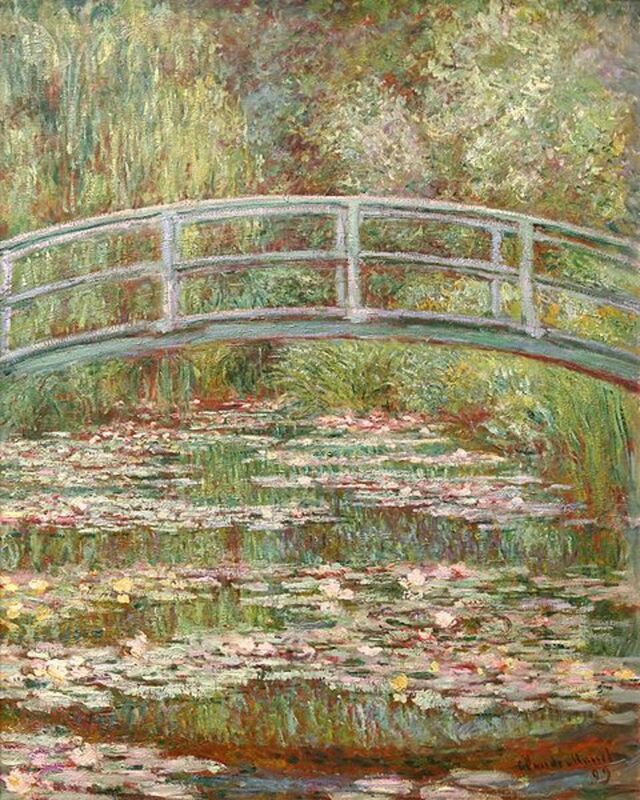 Which Modern Artist Is Better – Monet or Manet? 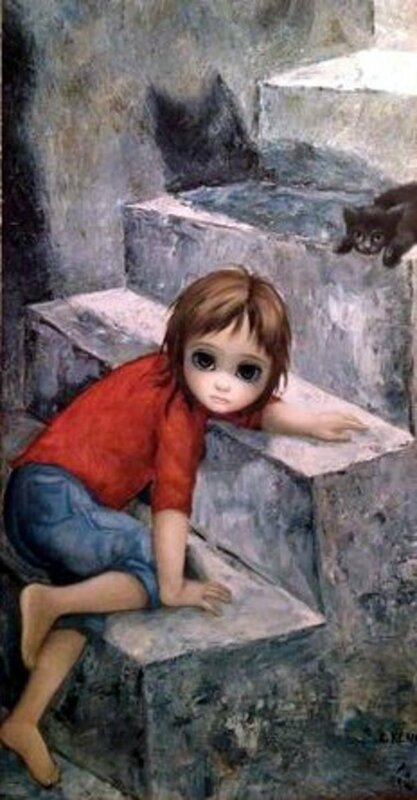 Margaret Keane Discussion - Do You Have a Favorite Margaret Keane Painting? 2 months ago from U.S.A.
14 months ago from U.S.A. They capture your heart, don't they? I still have 2 or 3 of the sad cat prints from the 70's. Made frames for them in shop class. 2 years ago from U.S.A. So good to learn of the many Artist including Keane , Me and my daughter set down to enjoy a movie and one night it was about her life and paintings. Very interesting, I am happy to know her story. 4 years ago from U.S.A.
Hi Carol! 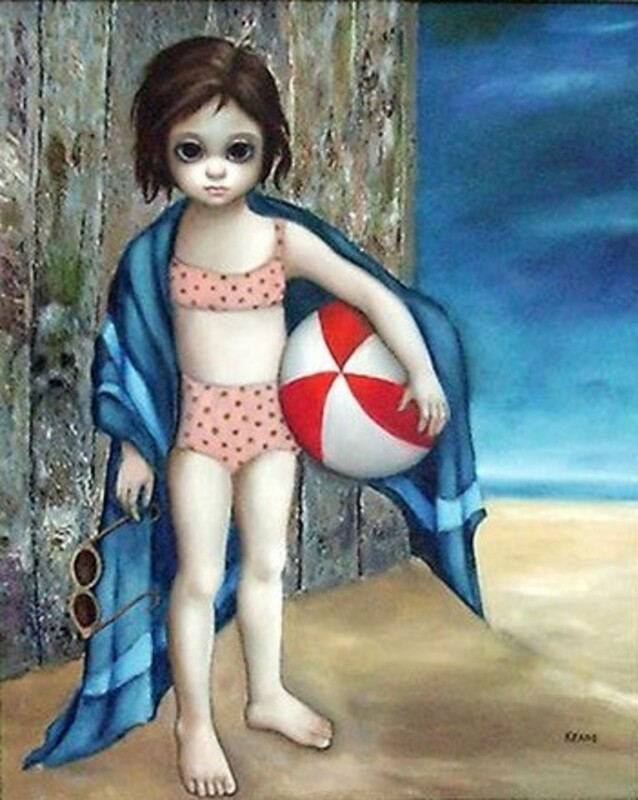 You can find Margaret's paintings and prints on eBay as well as Margaret Keane's official website: keane-eyes.com. I love her paintings and I would love to know where to purchase a print of one of her paintings. She is amazing. I have a portrait of myself painted in 1954 by Margaret. "Big Eye"s by Tim Burton is currently being filmed. 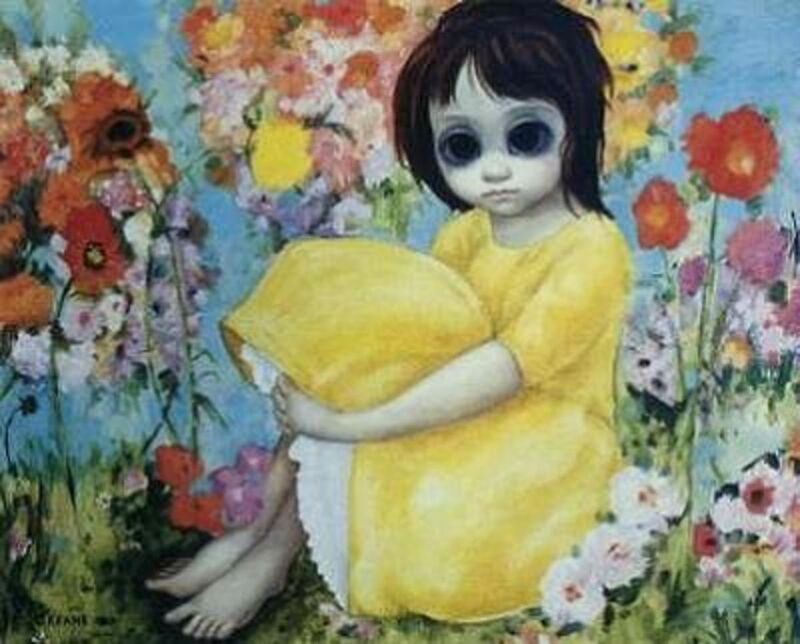 I remember seeing Walter and Margaret Keane's art in Woolworth's in Glendale, California when I was a teenager. When I was in art school it was popular to make fun of them, but I'm sure that didn't bother the Keanes who definitely found their profitable niche. Glad to see that she is still painting. Thanks for the lens. 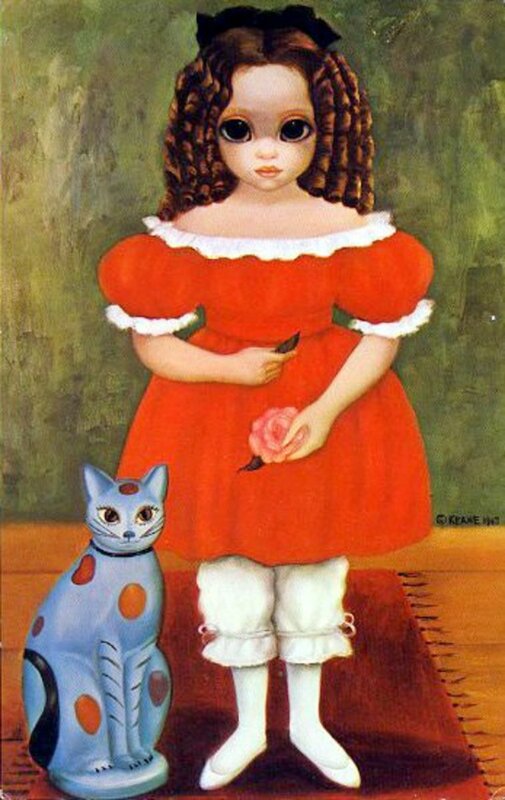 I had no idea Margaret Keane was still painting! What an "eye-opener" this lens has been! :o) Thank you! 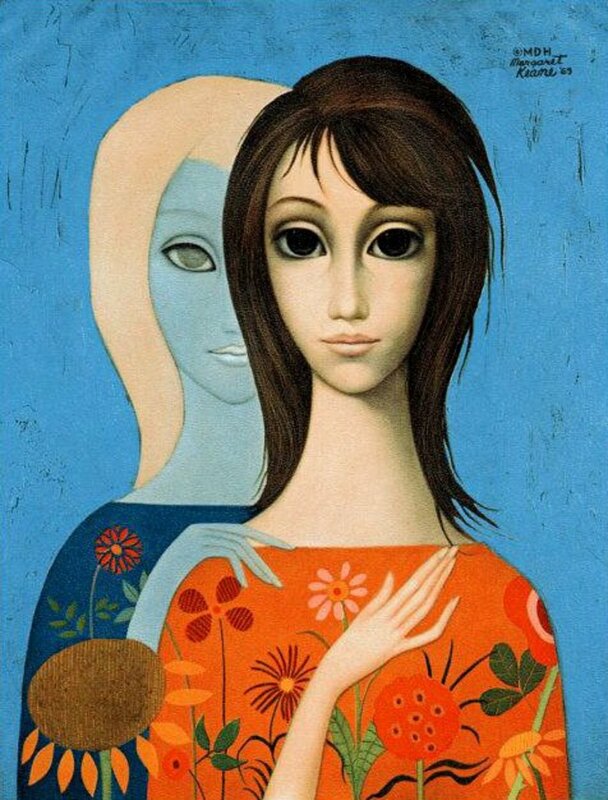 I've always loved big-eye art but didn't know that Margaret Keane was the forerunner of the style. She sounds like such a resilient and fascinating woman. I look forward to the film. This is a great tribute you've given her. 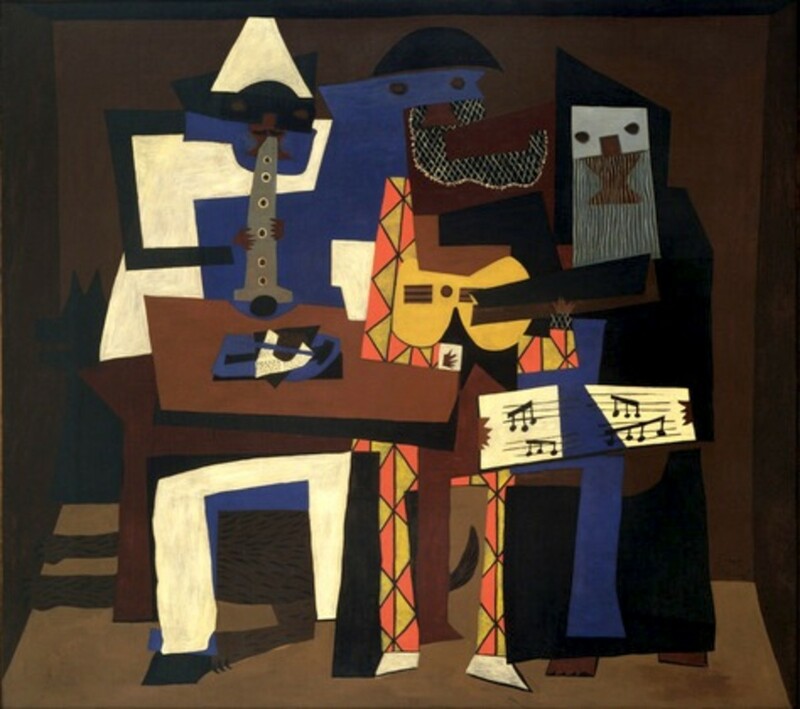 my favorite, if that's the right word, is "one for the money" ; for a long time i never understood why this painting seemed to have such personal significance. many years later i was watching "carnival of souls" and when mary says .." it was as though i didn't exist; as though i had no place in the world, no part of the life around me." - it clicked - i knew who the "extra, uninvited one" was: me, in spirit. 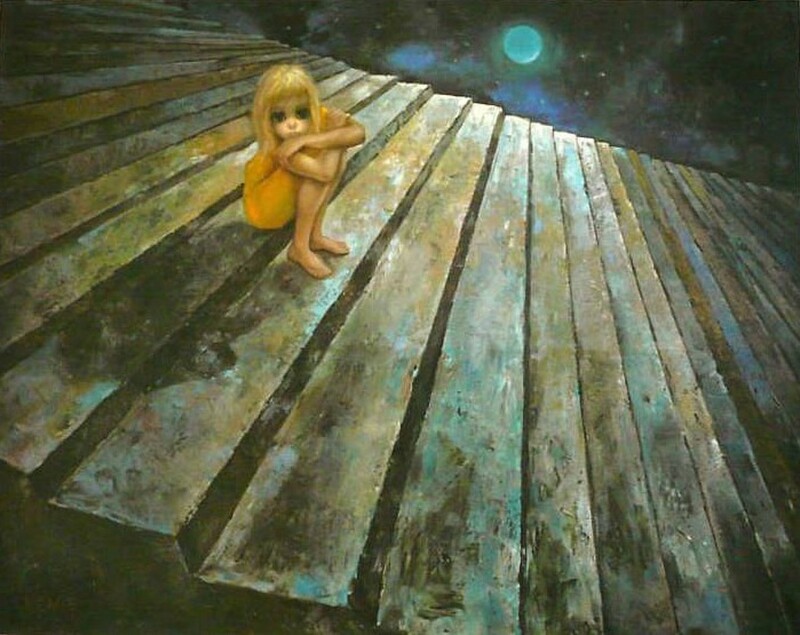 in general, her art (yes,art, not kitsch) has had an immense impact on my inner life; i'd love to write the stories for the girl-women in some of these paintings; they exist as mind-movies; more vivid, detailed than my own life, but unfortunately i don't have the gift. 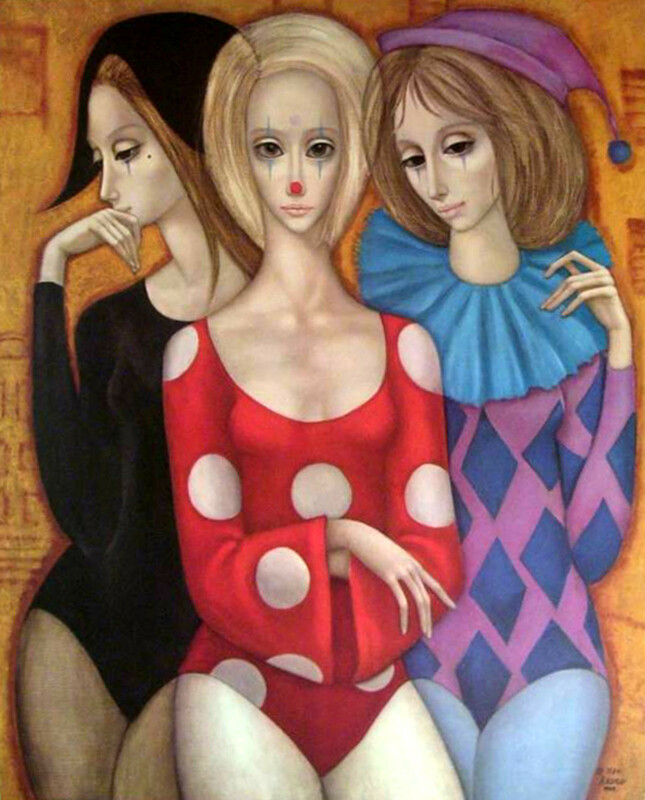 i can imagine a twilighted keane trio on the cover of the lost paris sisters album; so many of their early 60's songs had that same wistful, pensive quality. does anyone know the title of that painting visible behind the artist on the back flap of the 1964 "tomorrow's masters" collection? 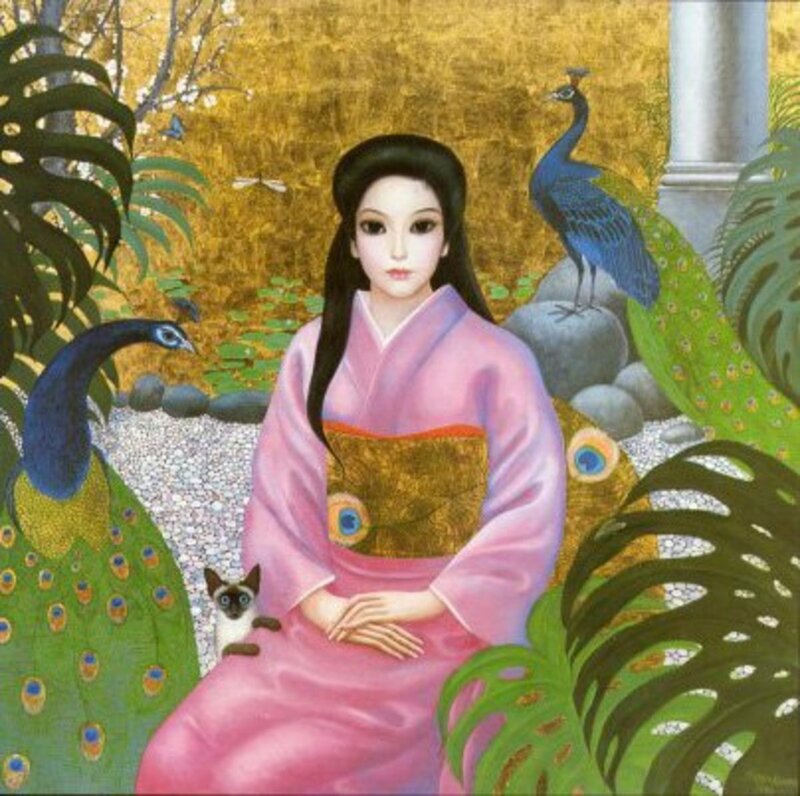 as with so much of her work of that period, titles seem to spring to mind; mine is "ready or not"
I have an original Keane girl in kimono with siamese cat. My kids think it's creepy , but I know it's nostalgic. Anyone interested? I live in Hawaii and would love to find it a new home with someone who appreciates it. Happy Halloween blessings to you! 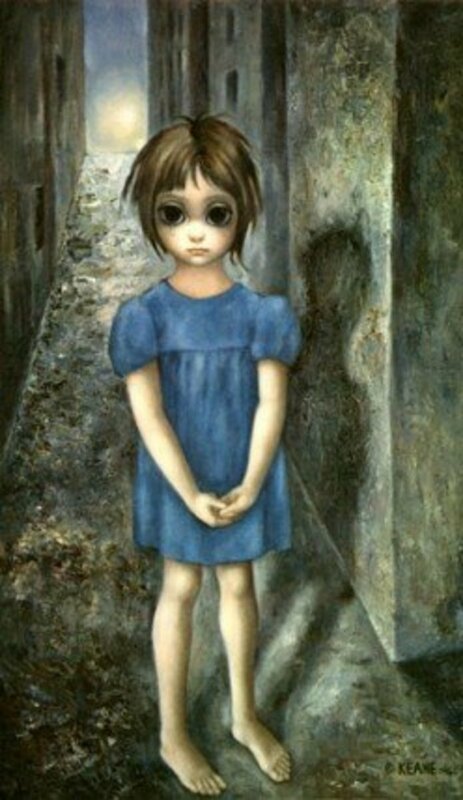 thanks for introducing this great artist margaret keane. lovely art work. Love those big eyes! What a fun lens you've made. 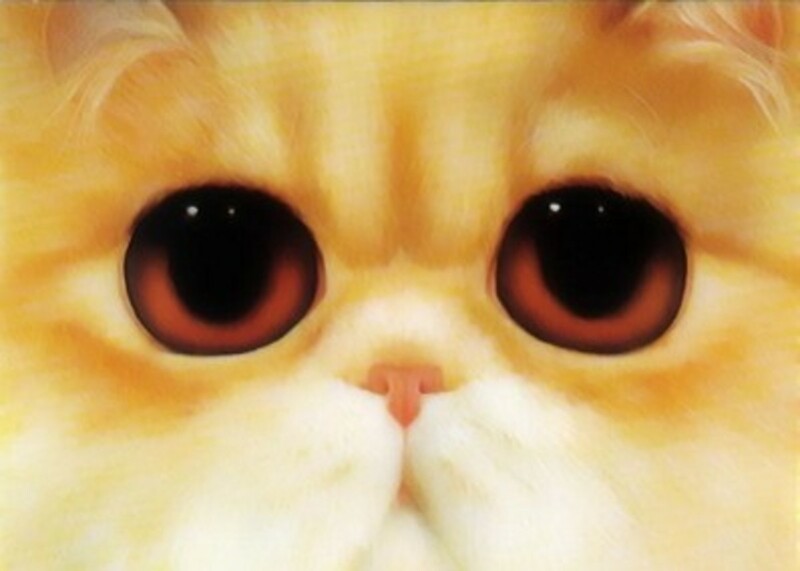 hmm .. maybe i am the only one who thinks those big eyes give a very creepy touch to every picture? Very nice lens! thumbs up! The feelings that you get from these paintings are amazing. Great Lens! 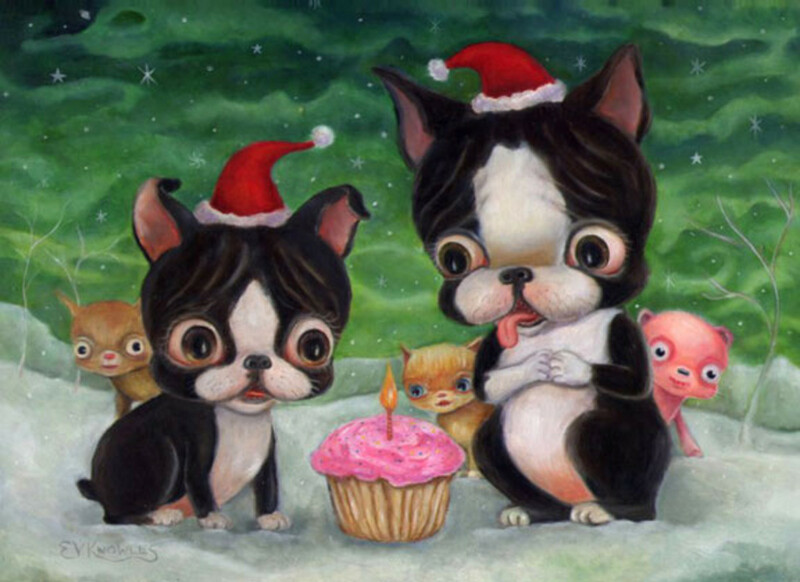 Absolutely adorable artwork ... incredibly talented artist! Very nice presentation. Great lens subject! Thanks for sharing! Escape is too beautiful for words. I love this lens. The art work is breathtaking. Makes you want to lose yourself in its beauty. Cheers. Love all the big eyes. Pretty lens. WOW....this is such a beautiful lens! Very nice lens! Keep up the good work! I remember her work now.. thanks for the reminder as I always liked it. Fabulous lens! I learned a few new things about Keane too (never knew about all the issues with the ex). 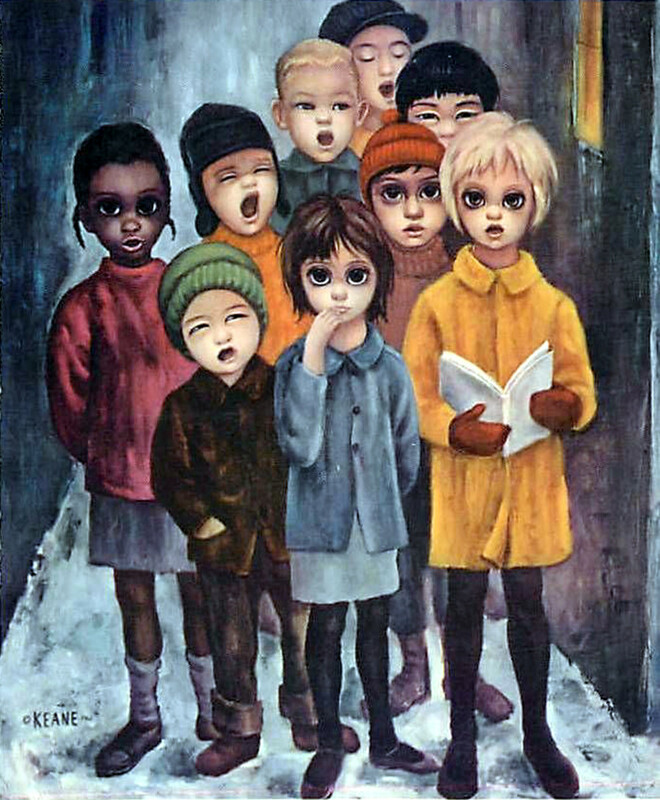 I fell in love with the Keane paintings in 1963 when my family moved to SanFrancisco. I lived just a couple of blocks from their art gallery(I believe that it was on Broadway, not far from Enrico's Coffee Shoppe). I will never forget that I was asked to sit for a sketch, but never did! My favorite painting was of a young lady at night, walking Powel or Market street. I can't recall. I forget the title also. I've been here before but this time I am honored to have my wings and angel dust to bless this wonderful lens! Wow ... this is awesome! 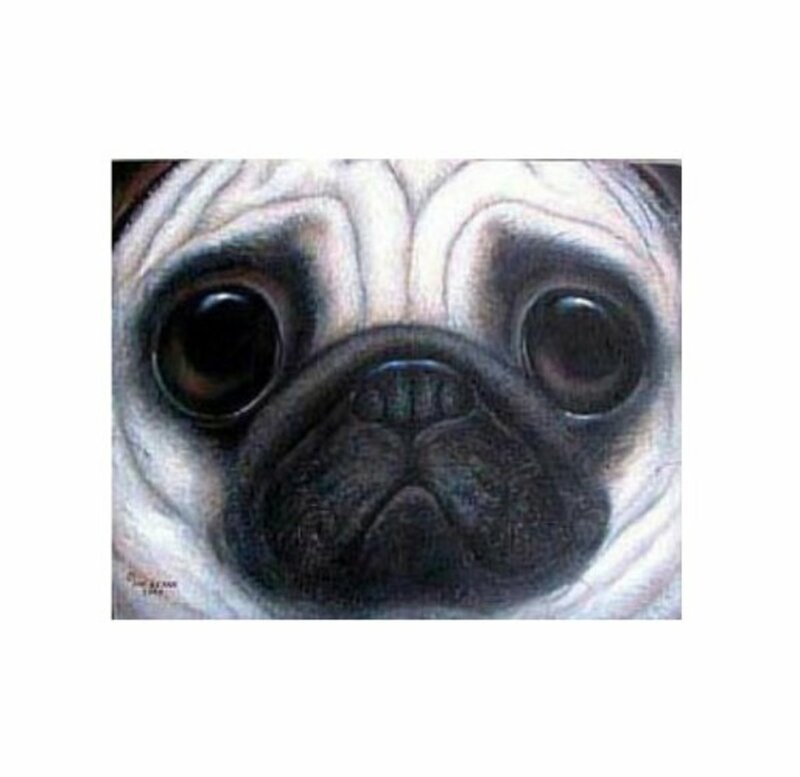 They are beautiful paintings and somehow the big eyes seem so sad, soulful! Great lens, Blessed! Attractive big eyes. Awesome lens. Well done. Beautiful! Blessed by a SquidAngel on the Back to School Bus Trip! 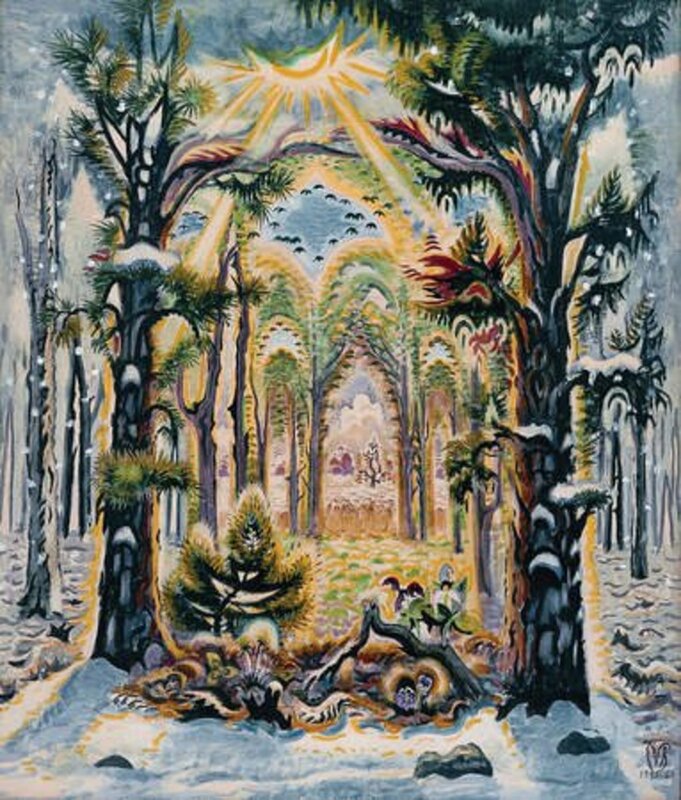 A beautiful presentation of Margaret Keene's big eyed art and I love that you told of her court victory, a picture does paint a thousand words! ALL of your work is wonderful. These kids remind me of the "Talky Tina" doll in the old Twilight Zone episode..."My name is Talky Tina and I'm going to kill you..." YIKES!! Great lens! I love your selection of pictures! I'm not quite sure how I found your wonderful lens but I sure am glad I did! 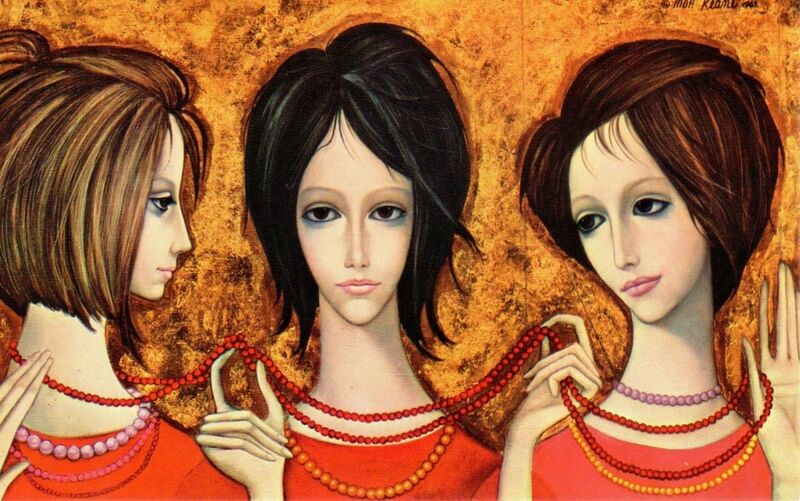 I love the artwork you've spotlighted and the fascinating information on Margaret Keane. Eyes are just sooooo expressive. 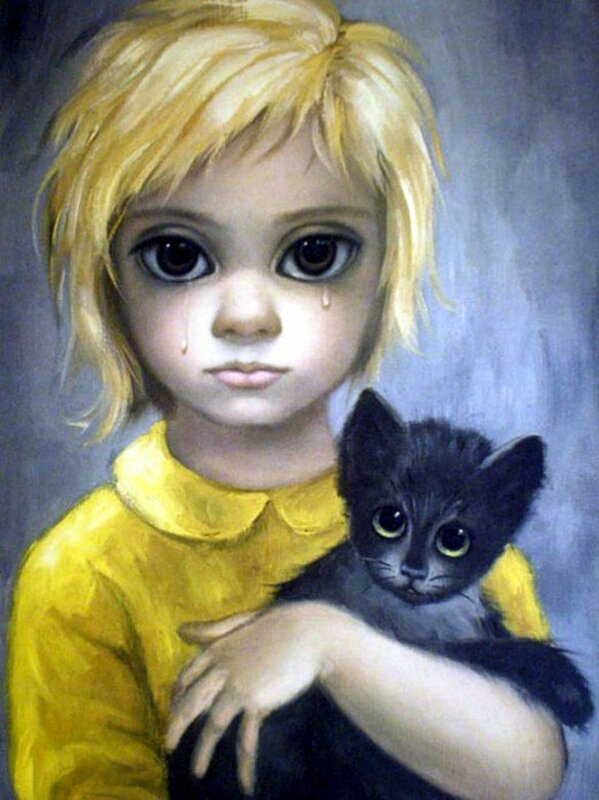 I have always loved Margaret Keane paintings. I love The First Grail (1962) painting. Great lens! 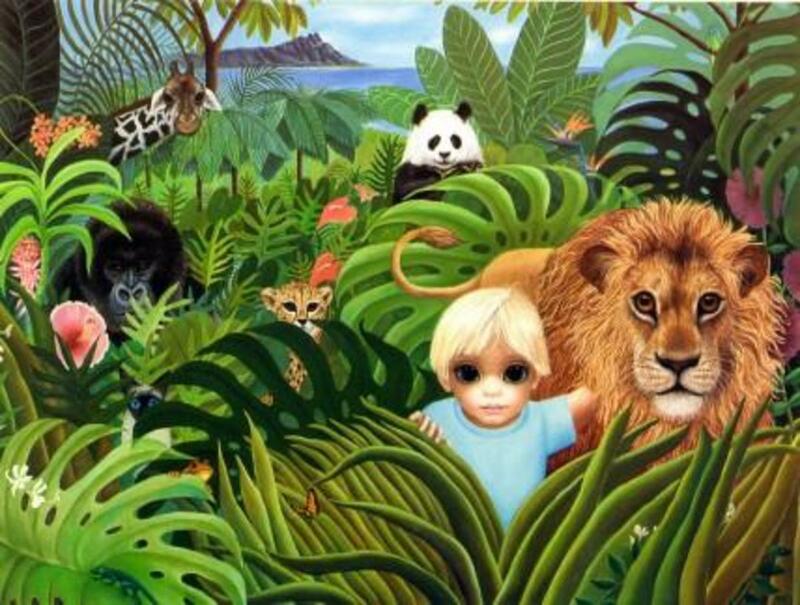 Margaret Keane is my favourite artist! Especially the ones with the wild animals with children. I am so happy you included the reasons that her faces are now "sunny and optimistic,"
It was interesting reading about her but I've always found her work slightly creepy. great lens! 5*.... I have a few small prints I got when i lived in San Francisco...I remember the contoversy between Margaret and her husband. I never could figure our who painted what...I'm glad she is still painting...good for her.